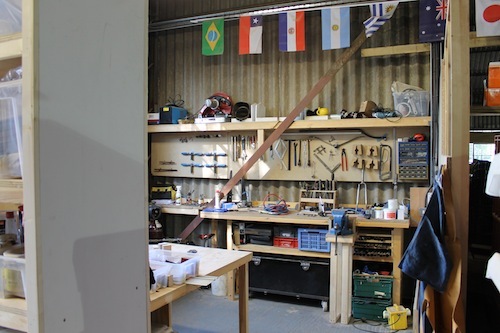 A new workshop, a new chapter.. 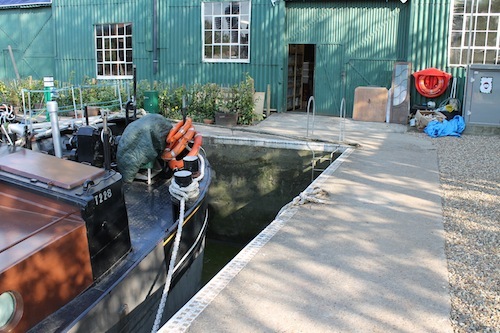 The approach to the island workshop, a 1920s boatyard built for repairing Thames lighter vessels. The boat moorings here are tidal. 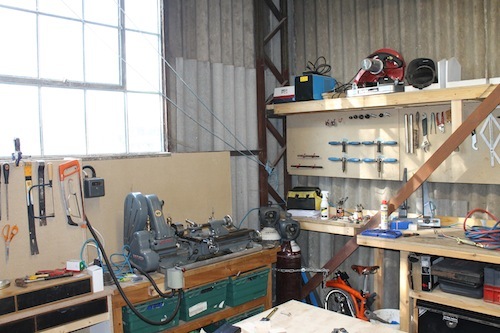 I decided to set myself up in a workshop nearer to my brazing job at the Brompton bicycle factory. 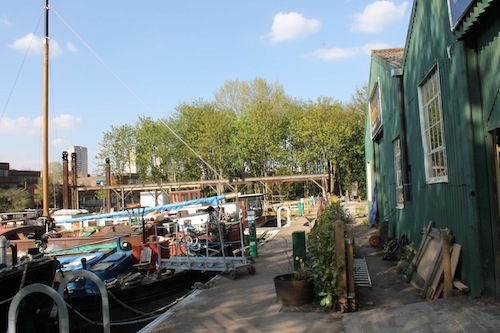 The building is an old boatyard on a small island on the tidal Thames in west London. Original heavy machinery still features on the island. 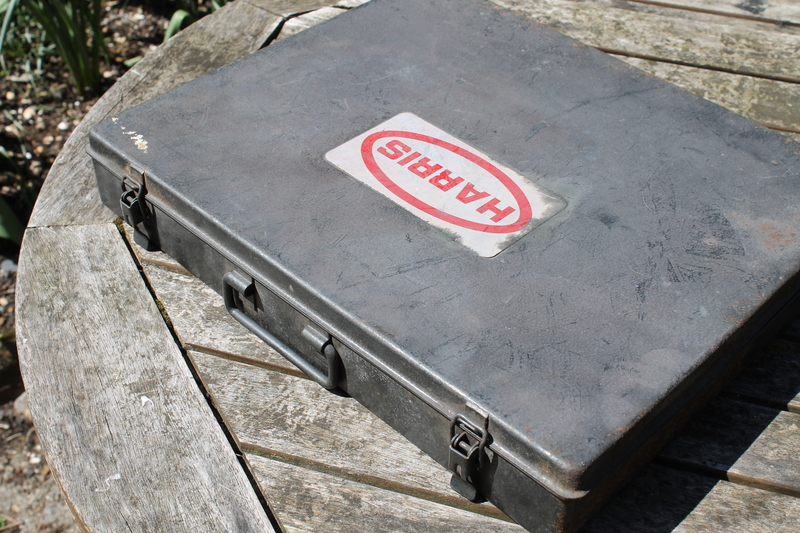 My unit – compact, but everything I need in an inspiring setting. 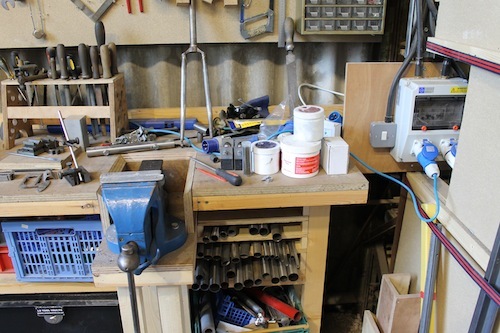 Still some organising to do, but it’s taking shape. 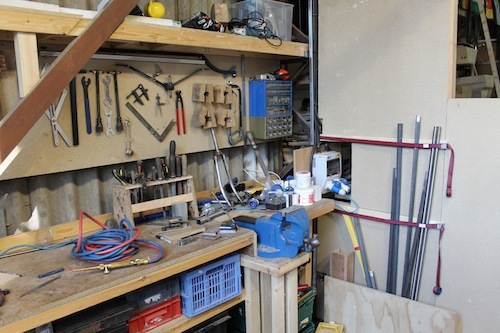 The cockpit – I really like the atmosphere here – skilled yet modest craftsmen come and go in the building and the light and changing tides alter the feeling of the place daily. Finding a place for everything took time but it’ll pay off. 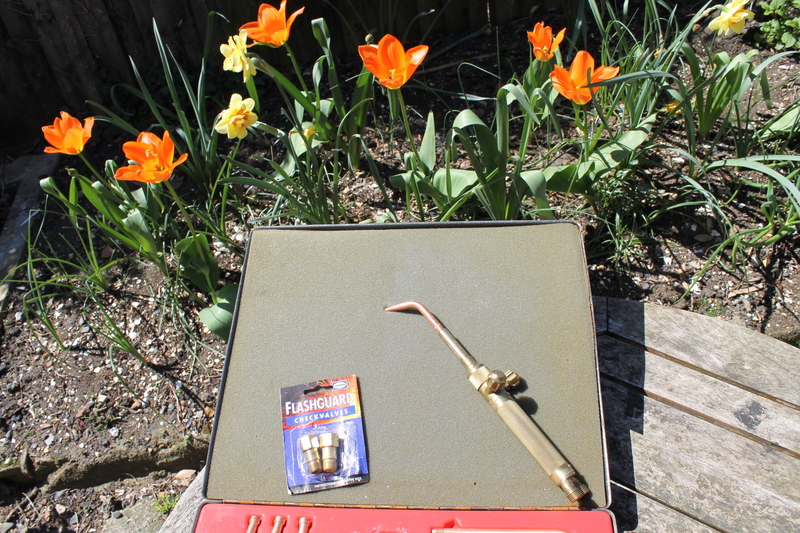 I thought it was about time that I bought myself a decent torch. 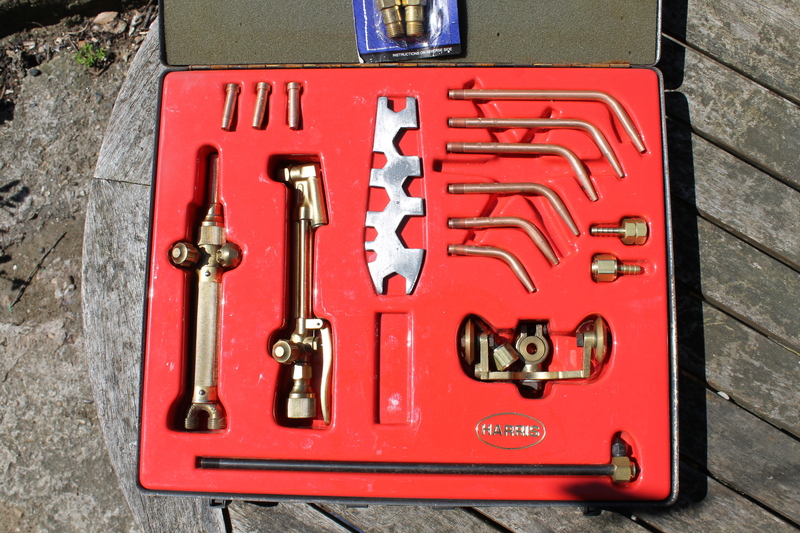 I bought this old Harris 19-2 torch set on ebay the moment I saw it. Decades old, but never been lit. Even has a cutting head. 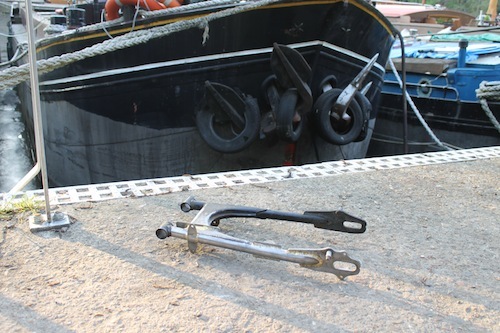 I am based at a working boatyard, so you never know, I may find a use for it. 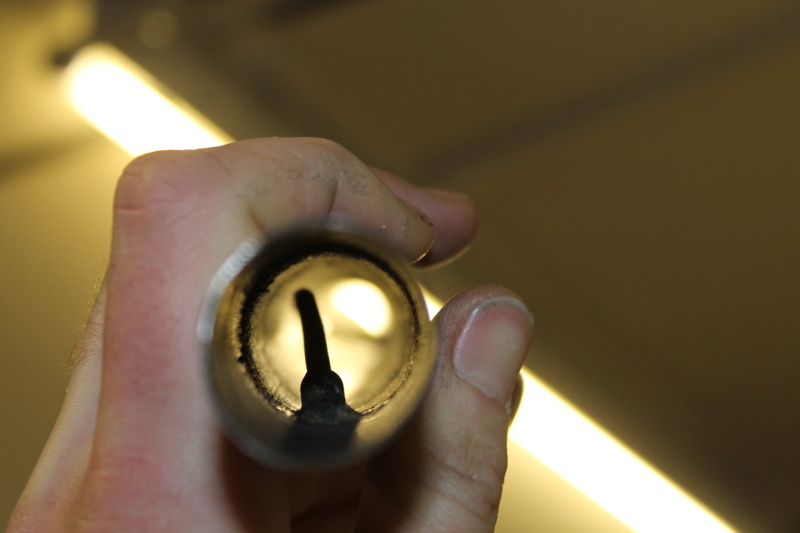 I found some reverse flow check valves for it too. Obviously I’m already using flashback arrestors. 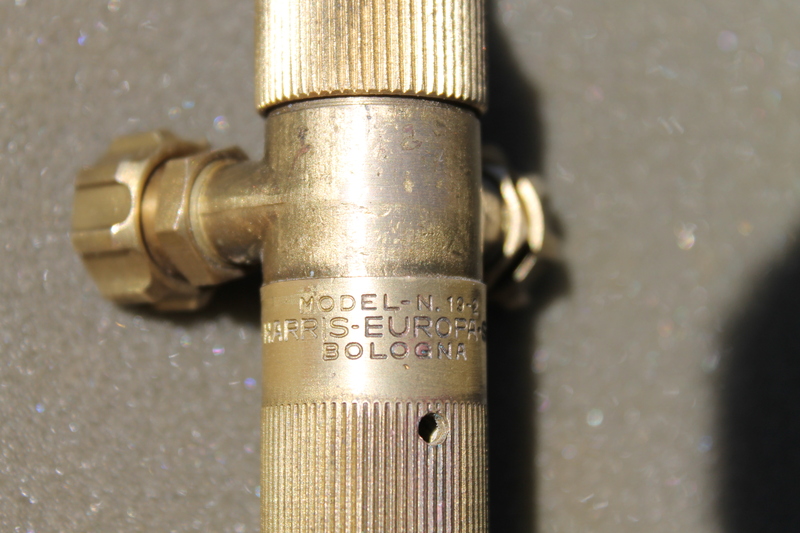 Harris is a US company, but my torch is made in Italy under licence as “Harris Europa”. It’s really nice to use and very quiet. 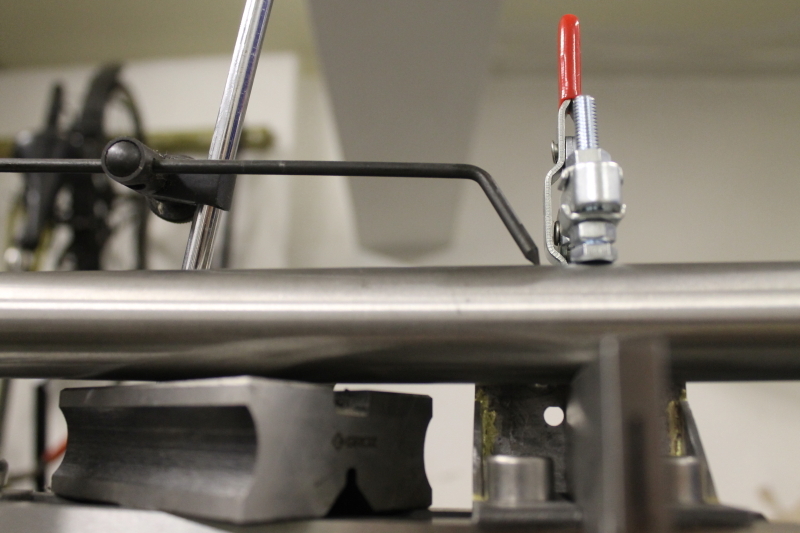 In my day job as a production brazer at Brompton, we use injector-type torches which are great for use with gas fluxers as they really help to push the braze forward and shape the beads with their added thrust. 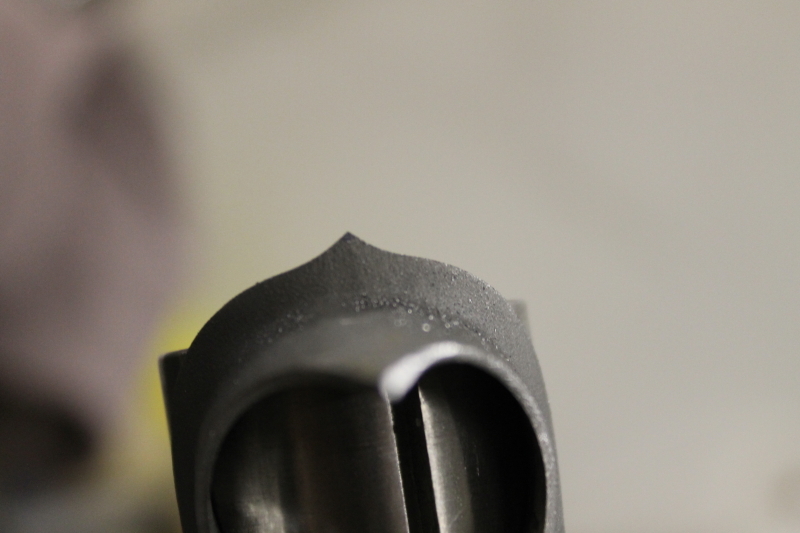 I believe that my Harris torch here is what is known as an “equal pressure” torch, which gives a slightly gentler flame that’s easy to control and should be good for making smooth concave fillets. I’ve also decided to restore an old Honda CD200 motorbike as a project so that my commute to the bike factory and errands to and from the workshop might be more practical. Sorry if this appears off-topic, but I was without a workshop and a torch for a good few months.. 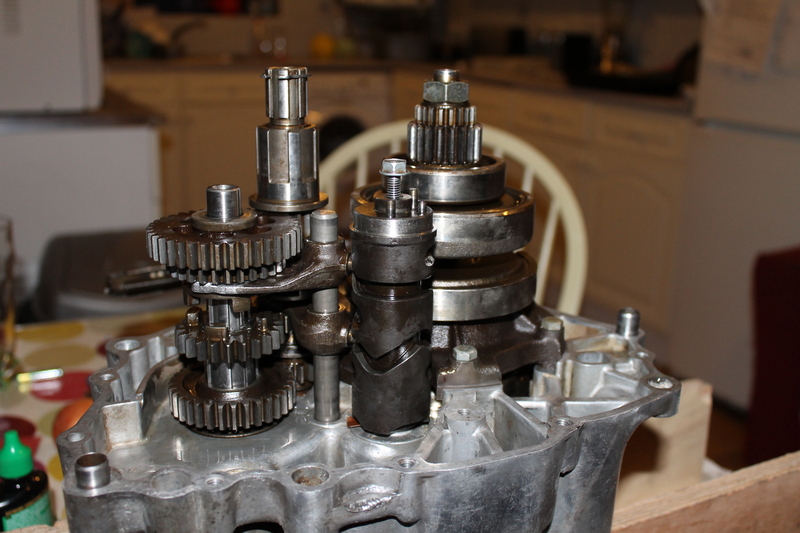 The countershaft was worn where the front sprocket mounts, so I thought I’d rebuild the engine and replace any other worn parts, seals, piston rings, etc. 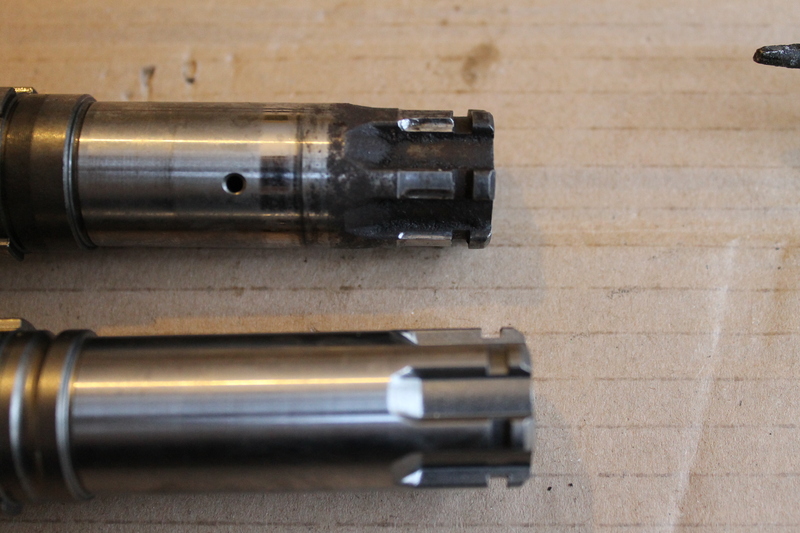 Worn shaft (top) and replacement. 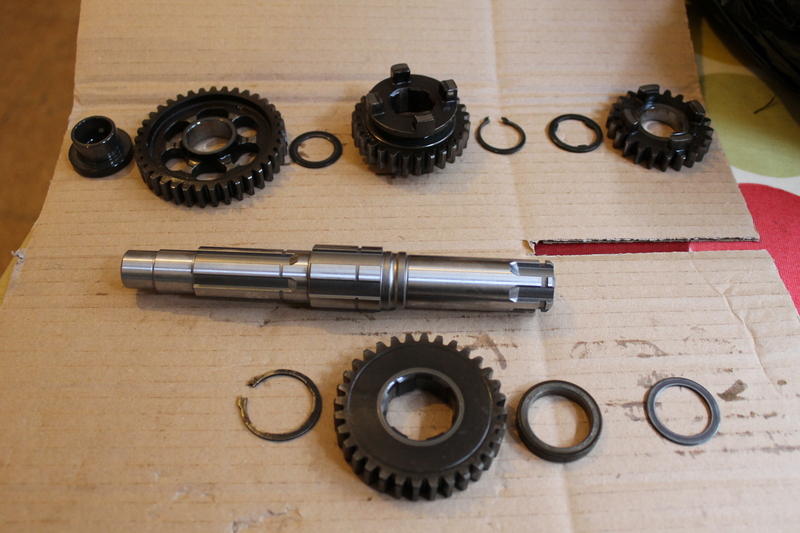 Now to transfer the gears.. 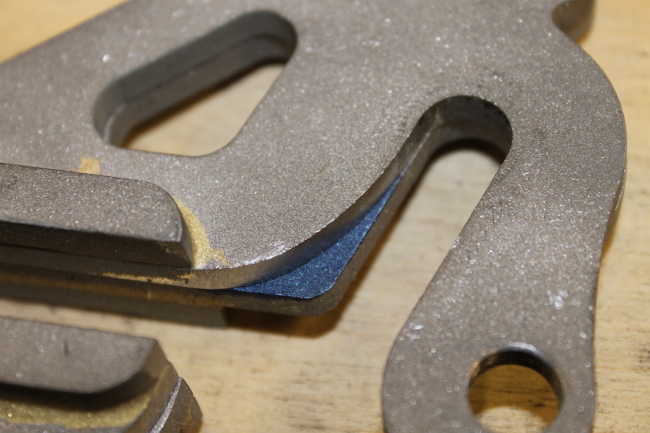 Laying all the bits out – checking against a diagram is important. 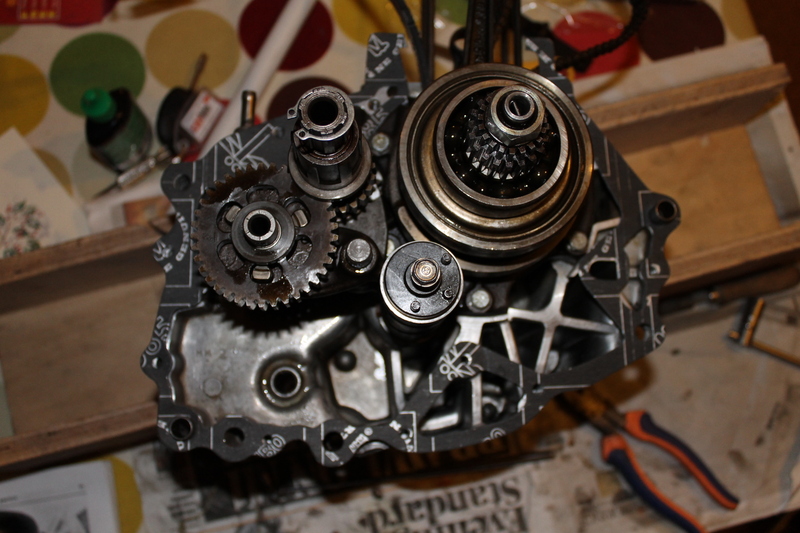 Rebuilt gearbox put back together in the crankcase half. 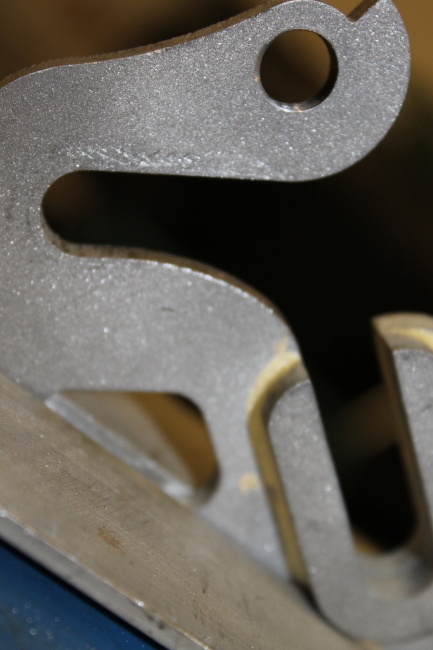 Top view with gasket in place. Didn’t fancy riding this too far.. 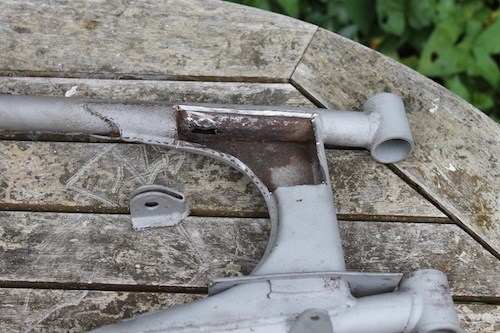 I found it impossible to find a replacement swingarm that was in good condition, and so I bought a used but rust-free US CM200 Twinstar swingarm which is very similar, but I’d have to swap over the driveside fork end (my bike has a bigger spindle to mount a cush drive) and a few other small mounts for the chainguard, etc. 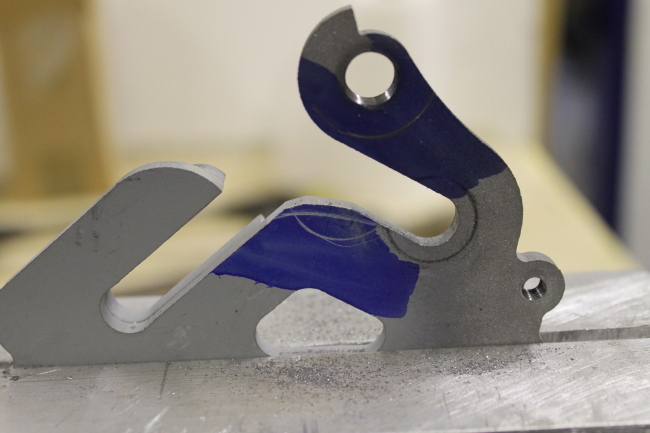 Marking out the template in new steel. 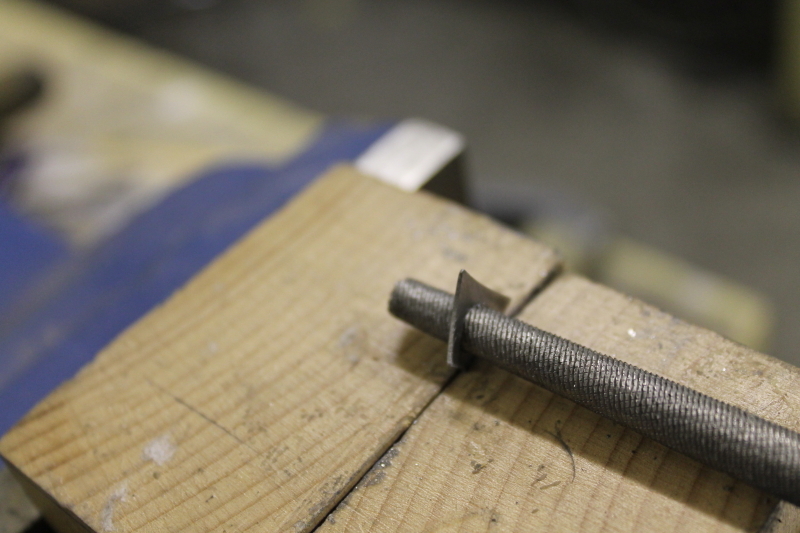 Then I drilled inside the lines on the drill press. 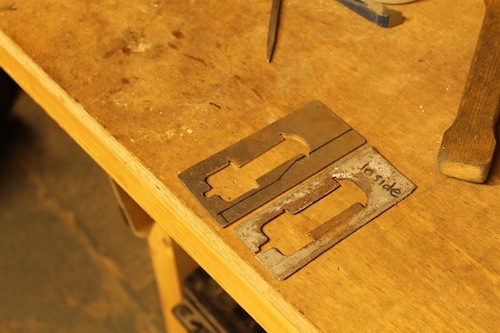 And cut and filed it to shape. 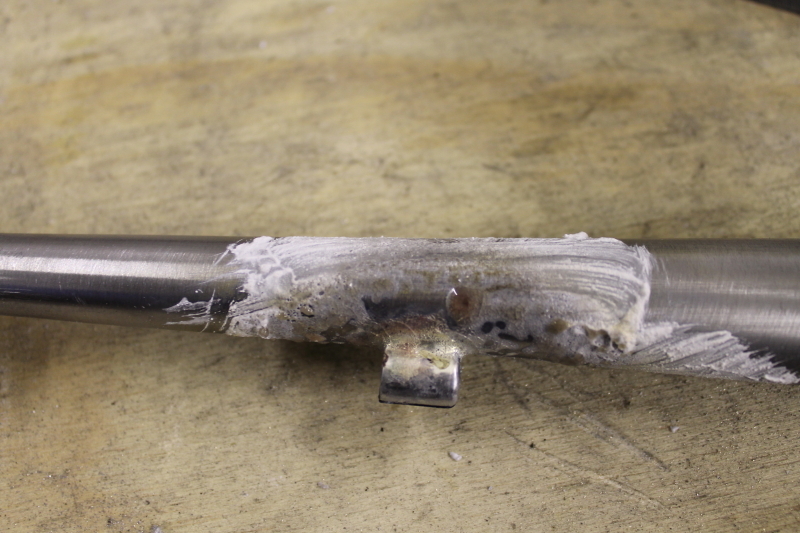 I brazed it all together with my ace new torch. I soaked the flux off in a bucket of water. 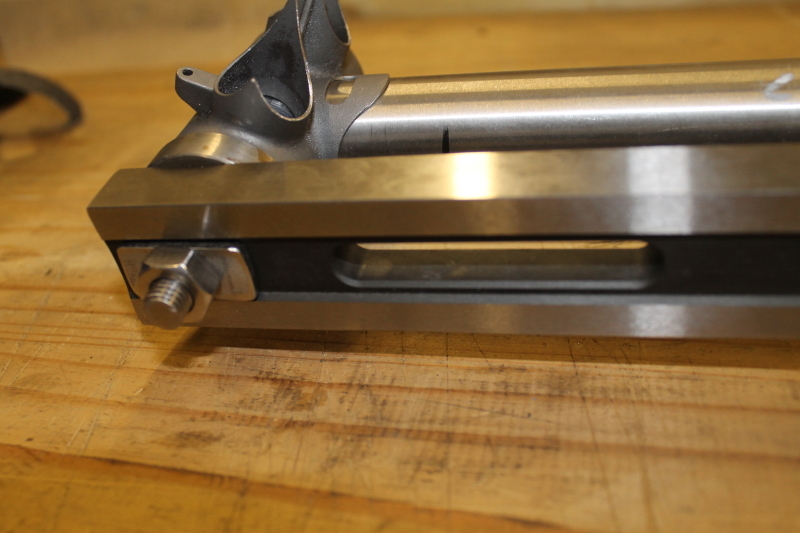 The finished swingarm. 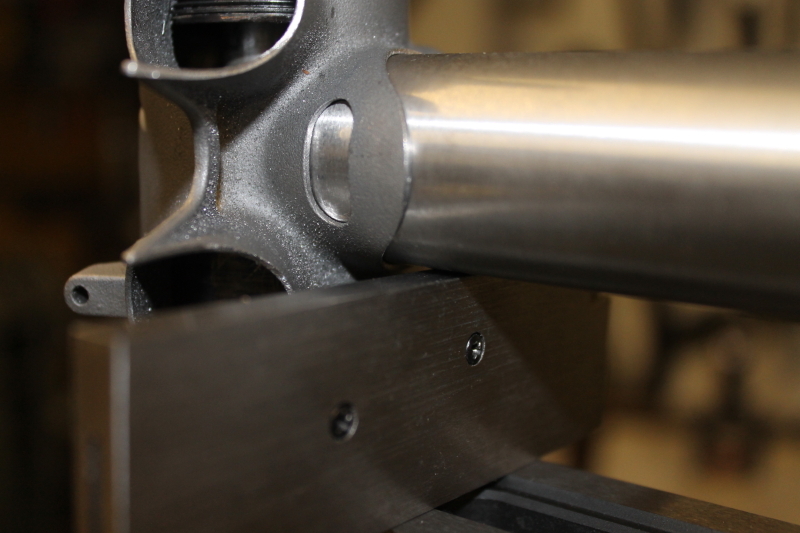 It’ll be powdercoated with the frame and then I’ll push new pivot bushes in. 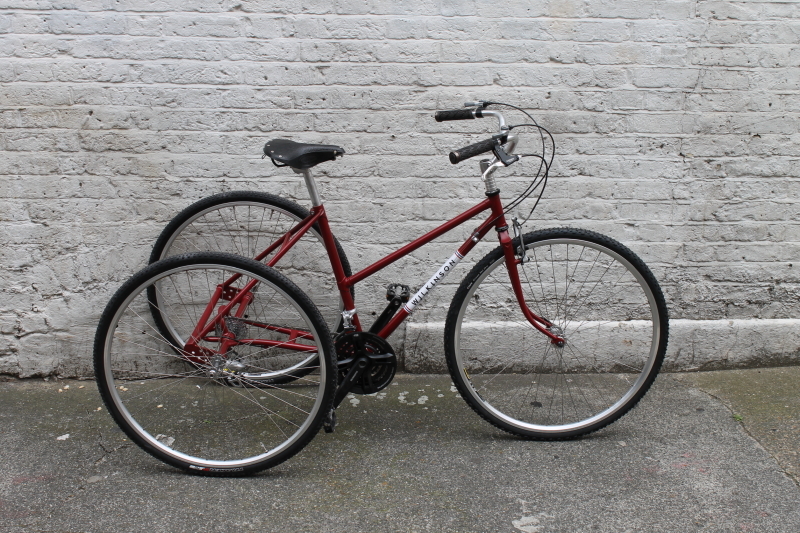 I promise my next post will be purely pushbike related! 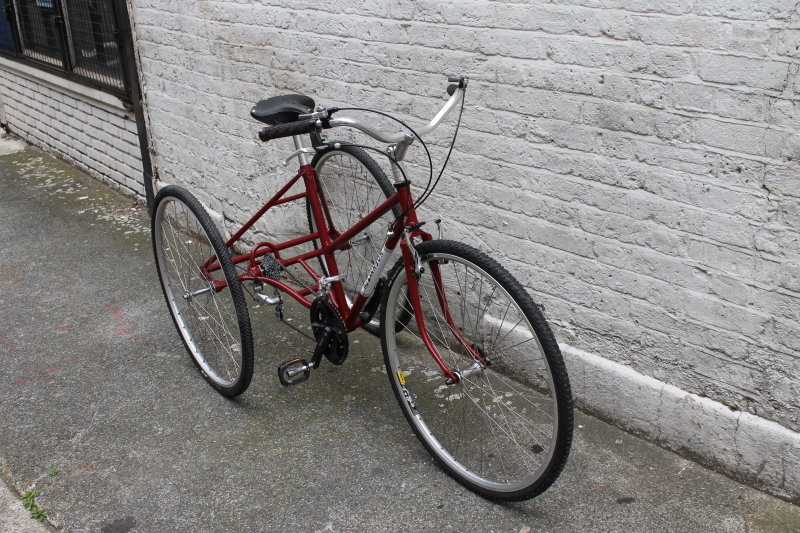 My uncle got in touch with me to ask if I’d build a tricycle for my auntie as a surprise birthday present. It would have to be able to cope with a gravelly farm track in South Wales, be a step-through frame design, and be 2-wheel drive. Er, yeah, no problem..
80mm rake gives this trike around 20mm of trail. 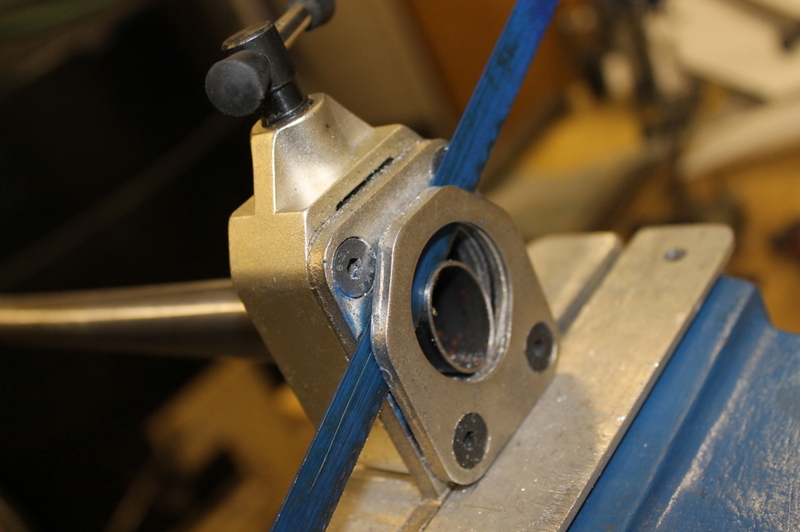 Bolt-on axle housing from an ebay donor trike. It’s one-wheel-drive at this point. 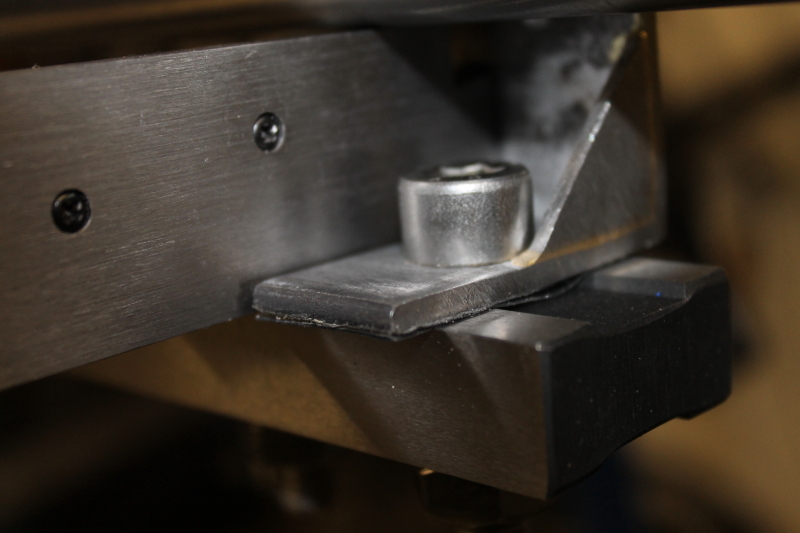 I needed an alignment shaft to keep all bearings within a tolerance of 0.75mm of misalignment. 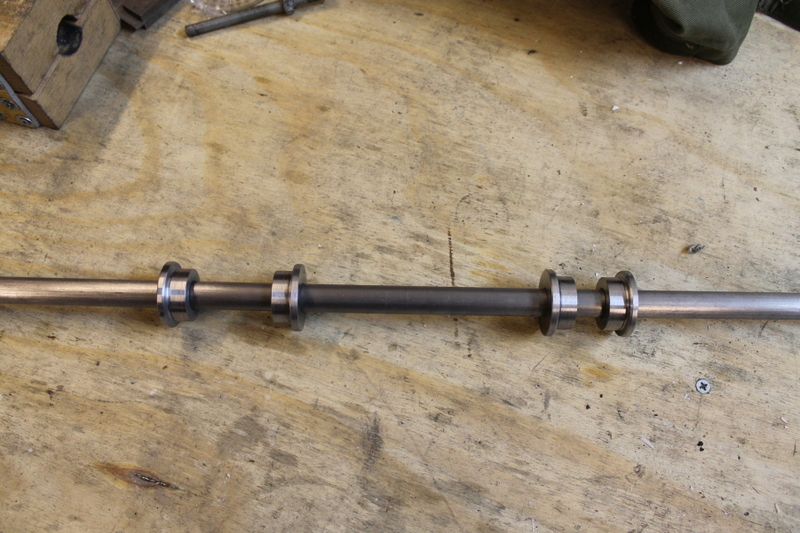 Gulp..
Sandblasted axle housing with alignment shaft fitted. 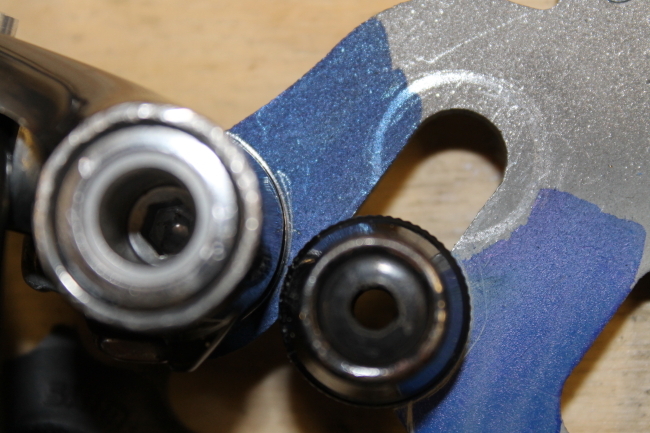 Bearing shells are right-threaded English BB size. I had some fun aligning this frame, I can tell you. Perhaps a little ambitious for my 4th frame, but I got her made on time, just. 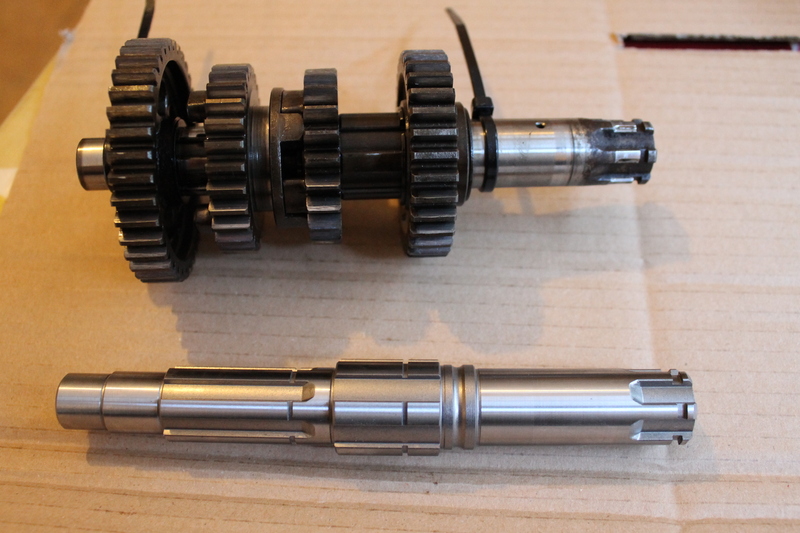 I found a Rogers bolt-on bike-to-trike axle housing, and had a 2 wheel drive cassette & axle made for it by Geoff Booker at Trykit. 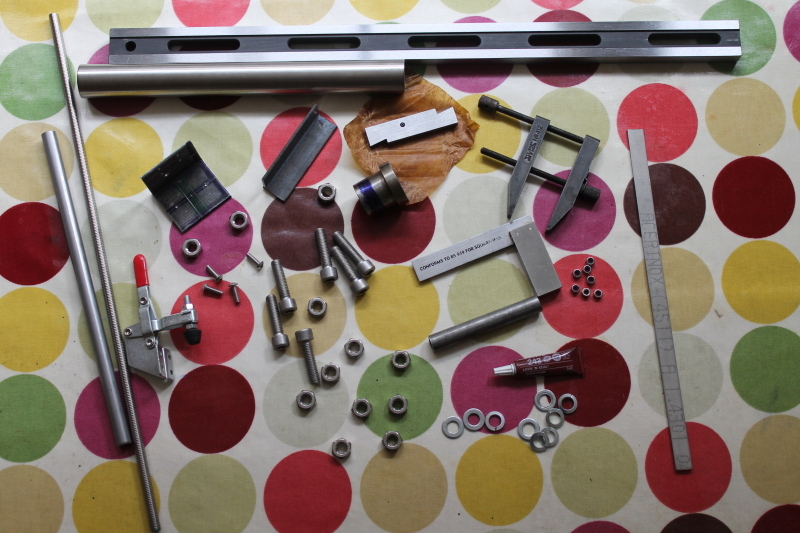 The Trykit axle and custom cassette body is a lovely bit of kit. 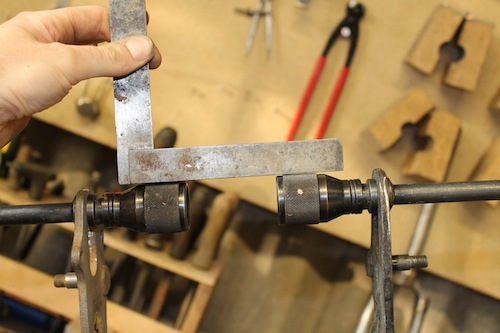 I removed the bolt-on tabs from the axle housing, moved the derailleur hanger boss and brazed the housing onto the chainstays with 4 dummy bearings that my friend John Discombe made for me. 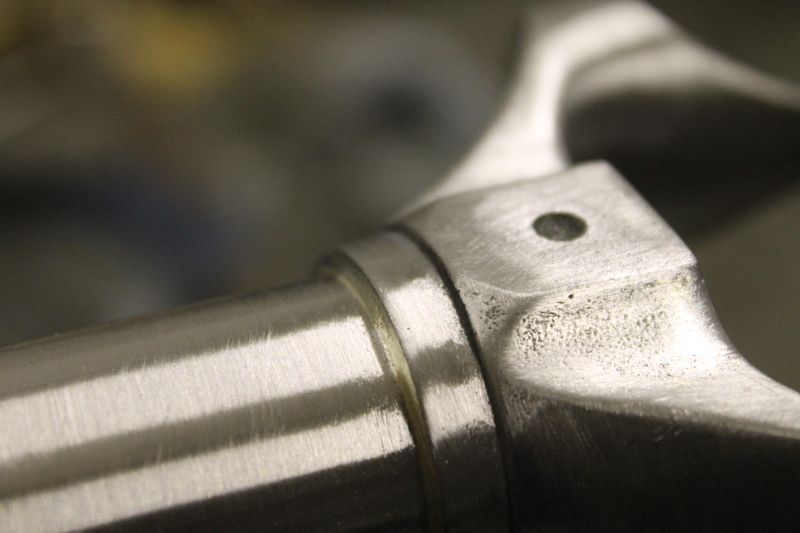 A cold-drawn 18mm rod was placed through the slip-fit dummy bearings to keep everything aligned during (and after) brazing. 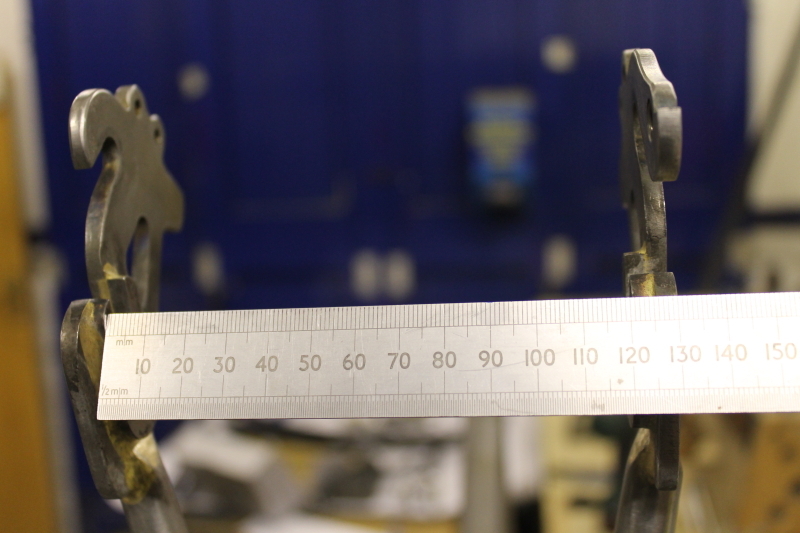 The drive-side chainstay had to be bent to clear the cassette housing. I’ve got balls. Have you? 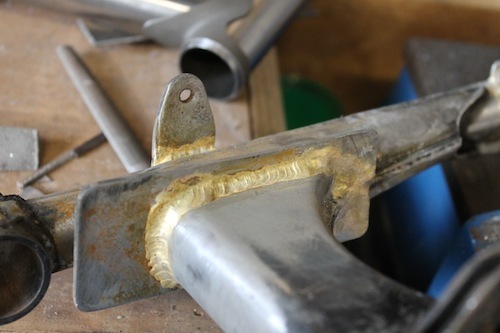 I used a ladies’ lugset that couldn’t really give the angles I needed, so I ended up fillet brazing the hockey stick, and I ran into trouble with seatstay heel strike (trikes usually have mega-low BB drops as they can’t lean and the lower C of G is beneficial to handling, and I had unwisely opted for a lugged BB shell that limited my angles), so I built tabs off the rear axle housing to bring the seat stays way back. 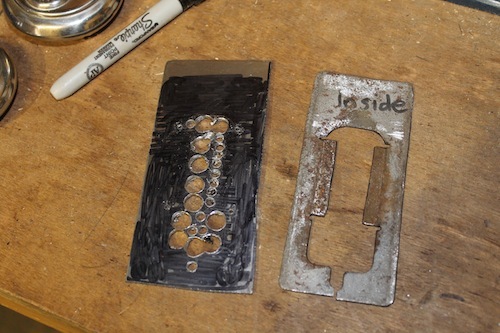 I drilled the hell out of the tabs to try and save a little weight. 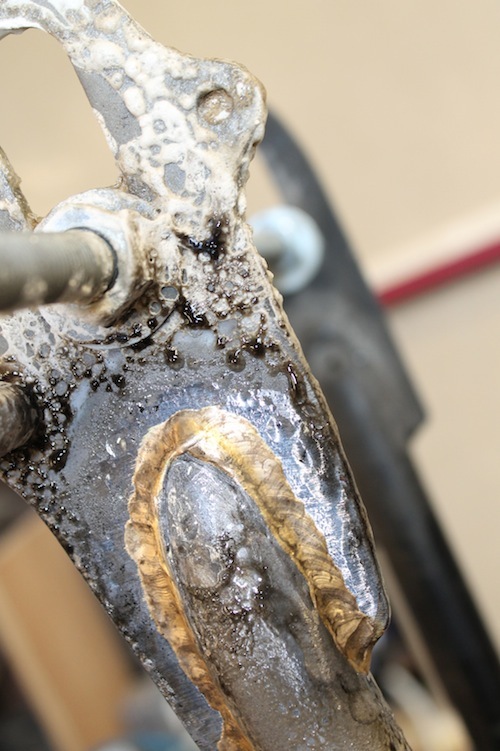 For a lot of the build I kept the chainset, a pedal and a shoe cleated-in just to be safe with heel clearance on the drive side. 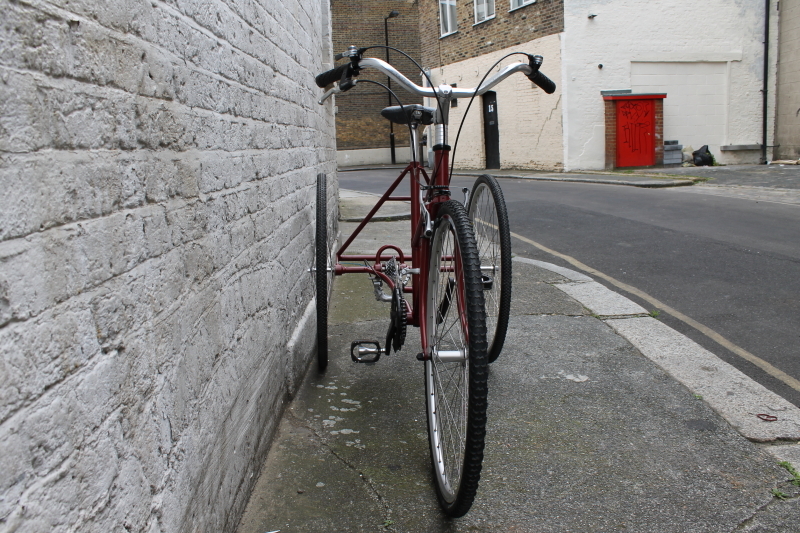 Trikes always tend to follow the camber of the road, so low trail is preferred to minimise the effort needed for constant steering input. 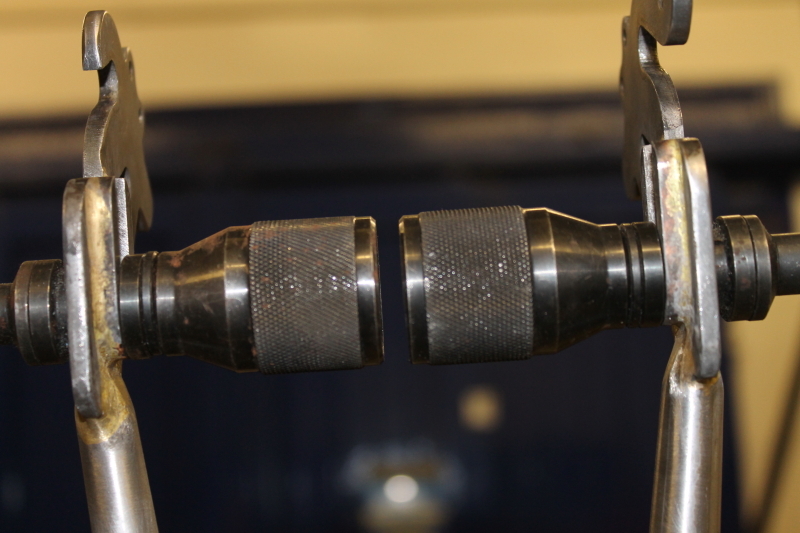 Seat stays are regular bike stays but used upside-down (thin end at the top). 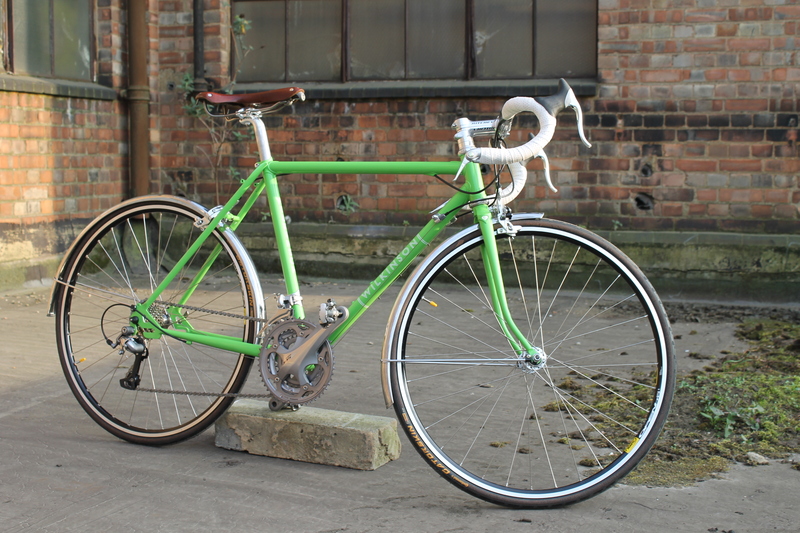 Cross tyres were chosen for the loose gravel surface it would be ridden on in Wales. 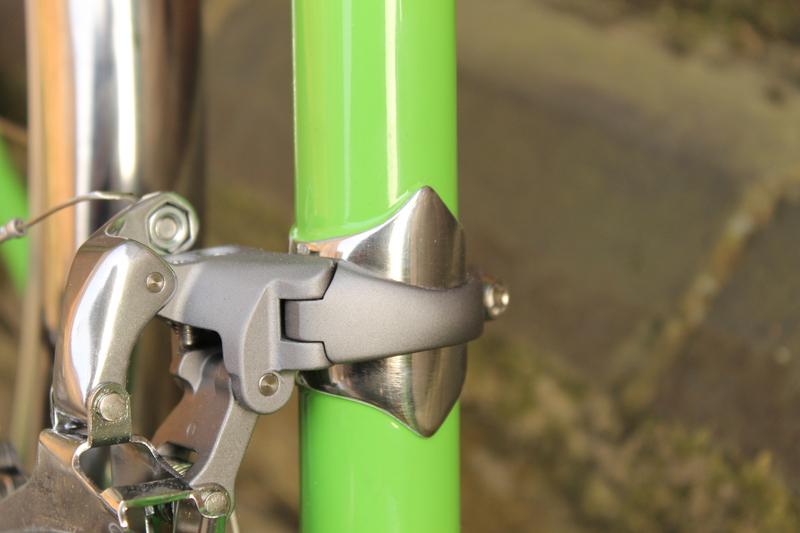 She’s now in Pembrokeshire, South Wales, and I’m told that everyone wants a go..
Polished stainless front mech band – protects paint and looks cleaner when removed for singlespeed mode. 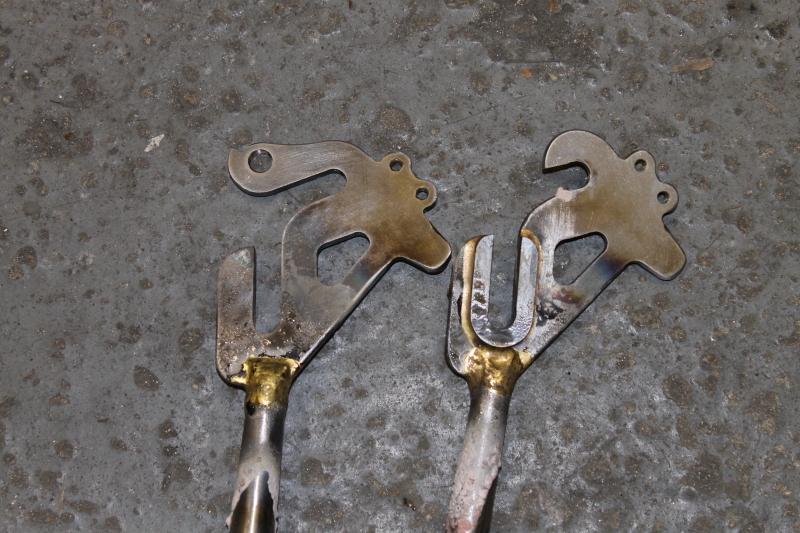 My “Wilkinson Mixed Gear” dropouts. 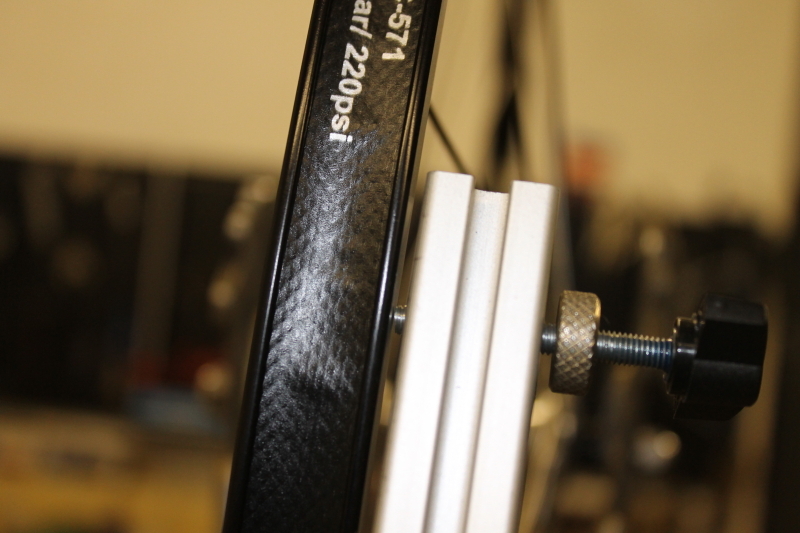 Mudguard extension tube allows for a more rearward wheel in tour mode. 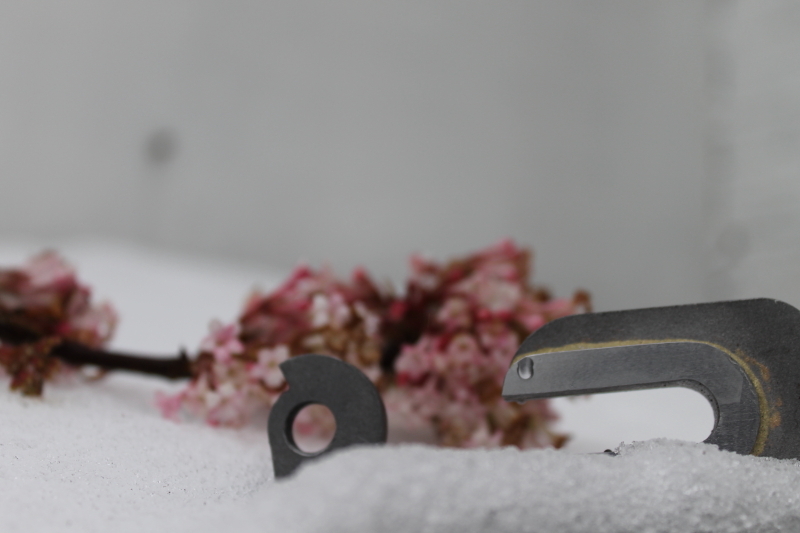 The Wilkinson Wheel Carrier – compatible with lawyer tabs! 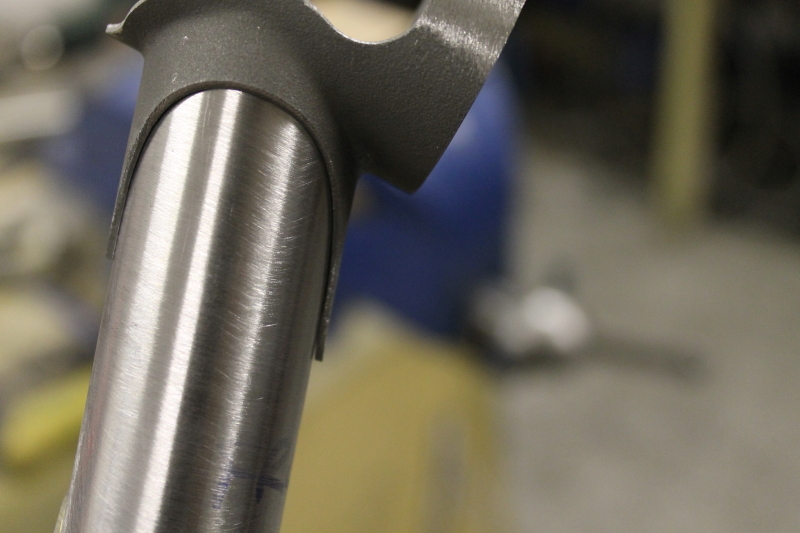 Removable shifter bosses pass through a stainless tube brazed inside the downtube. My girlfriend Saga for all her help, without which I’d have had a nervous breakdown. 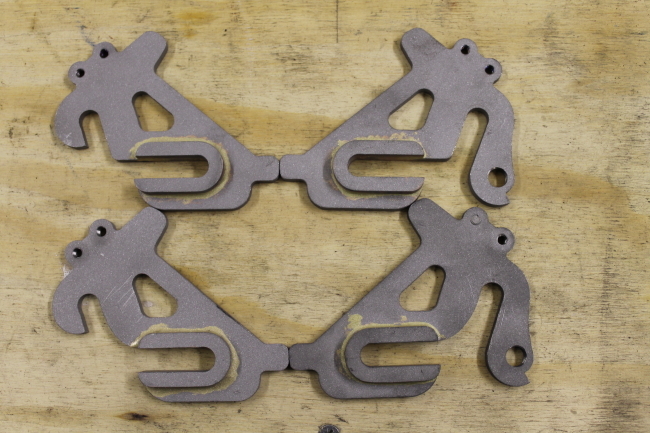 Dan Hamilton – for the CAD drawings for my dropouts. 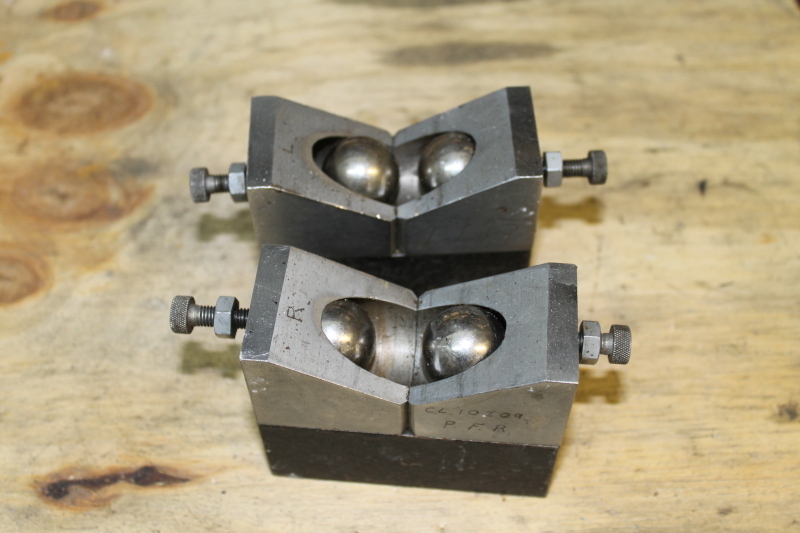 John Discombe – for all the help with the jigs so I could make my dropouts. Peter Flynn – for doing a great job with the paint. 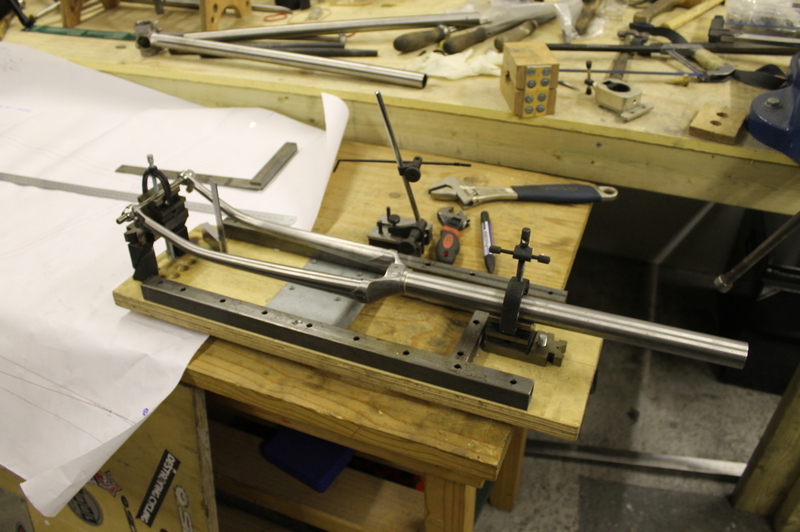 Ryan McCaig – for letting me borrow the odd tool and sharing the acetylene. 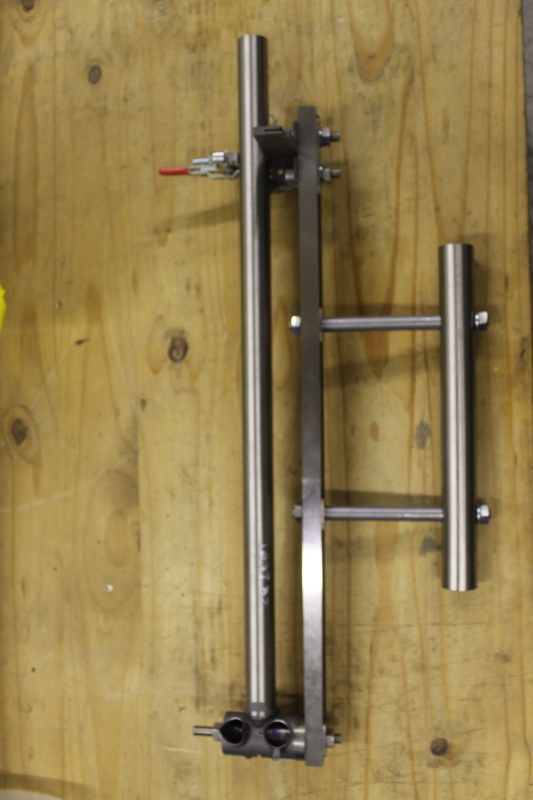 Dan Fennings – for doing the CAD for the wheel carriers. 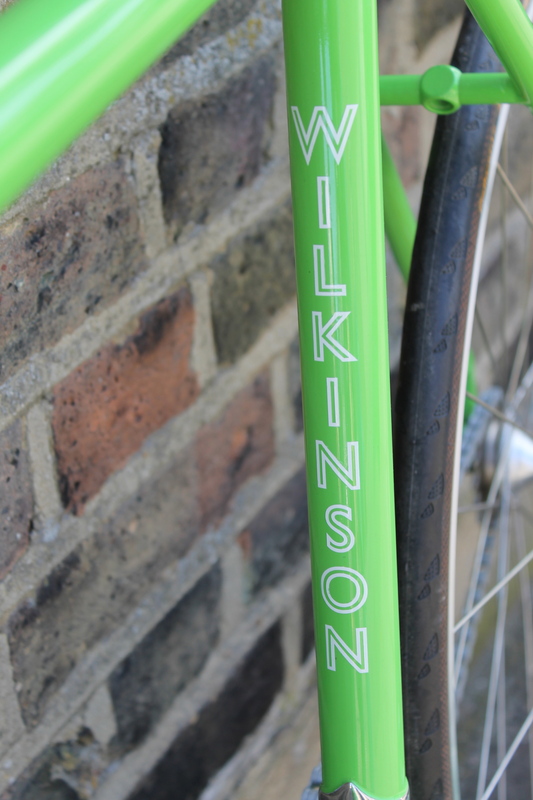 Tamsin – for commissioning Wilko 3 and coming up to the Bristol show. My mum – for lending me the car. Mike Salmon – for putting us up in Bristol and making us feel at home. Sarah and James at Brixton Cycles – for letting me use the headset tools. Peter at Ceeway for sponsoring the prize of a frame tube set. 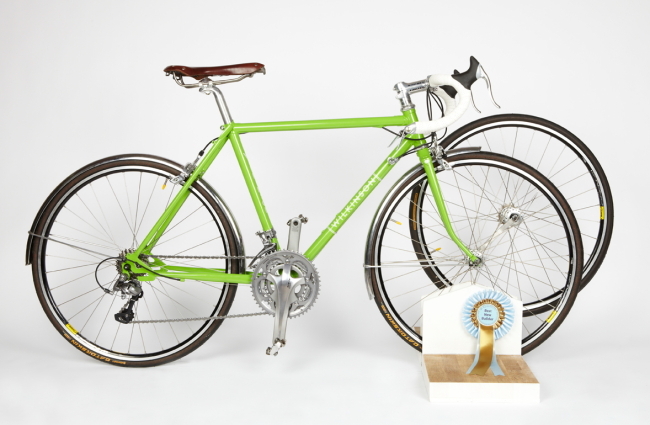 Columbus for sponsoring the other prize of a carbon fork. And everyone who came up and chatted, prodded the bike or squeezed the tyres. It was a great show. 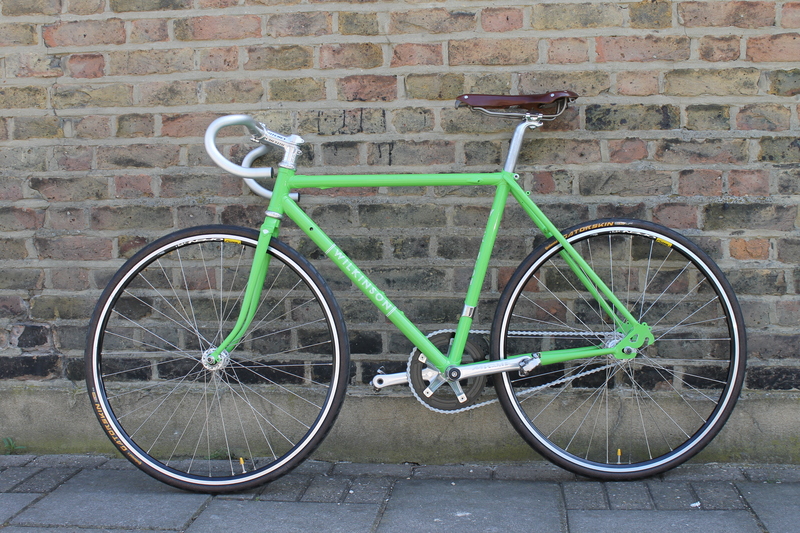 So I have to get this bike frame built and to the painters asap to be ready to build up and photographed before Bespoked. There’s no time to lose.. 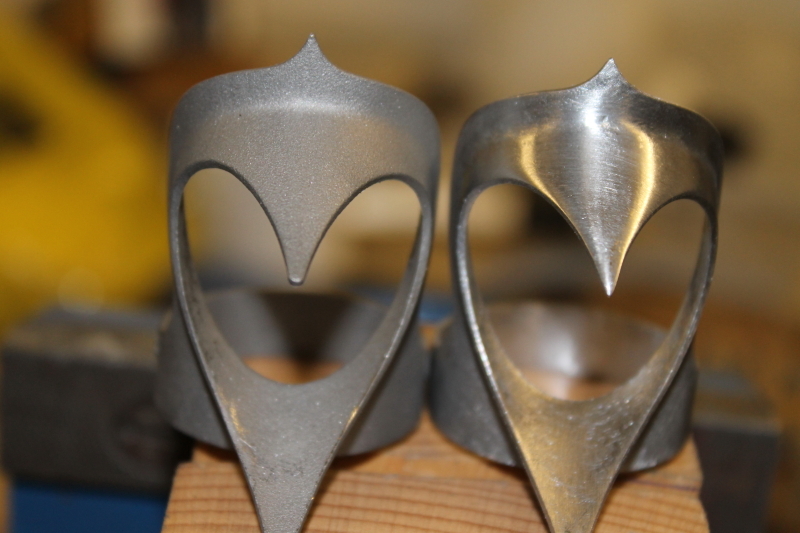 ..Better whip out my Herbie Helm lug vice. 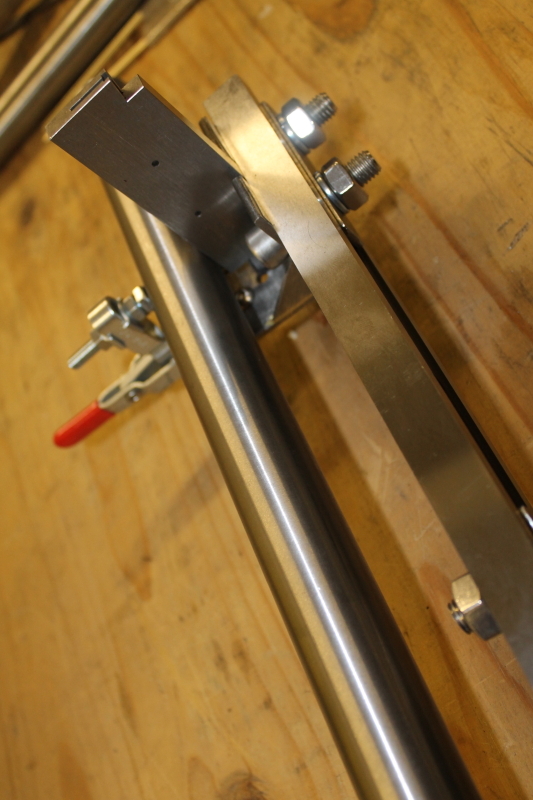 Stainless, of course. 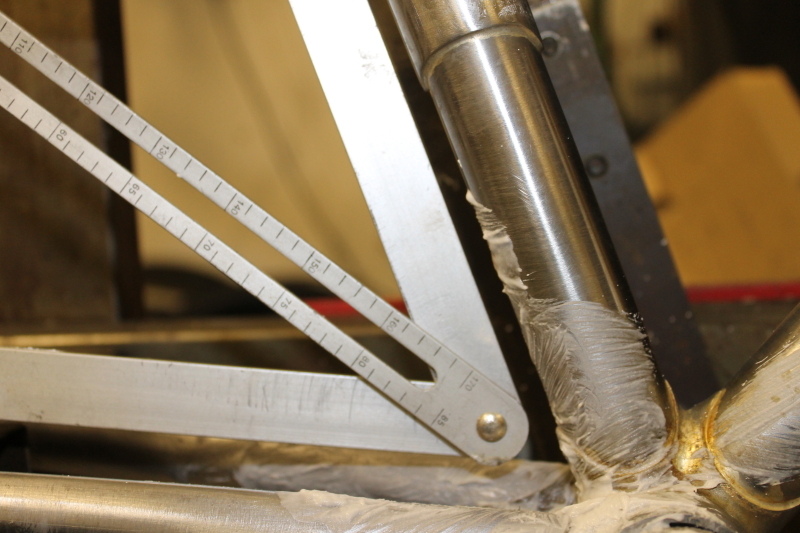 Checking my hand-filed mitres. Hmm. 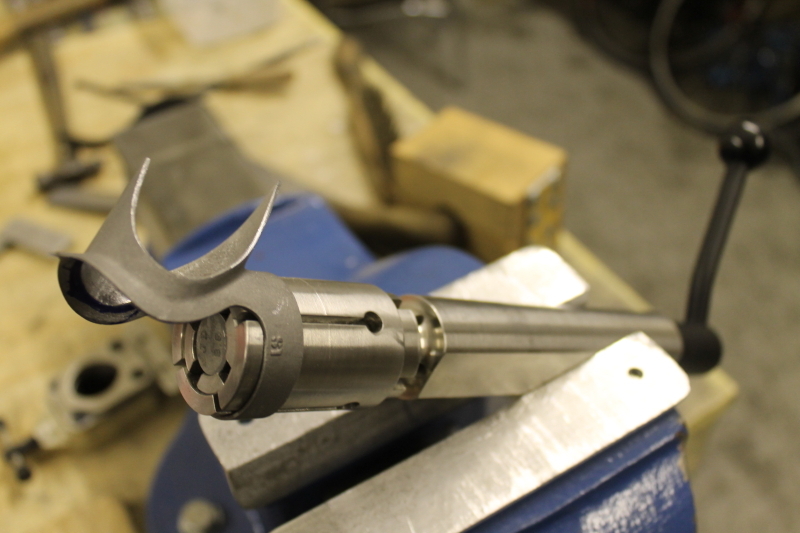 New lug and filed lug. Pointy. These can hurt you if you're not careful. Ask Ryan at Oak Cycles. 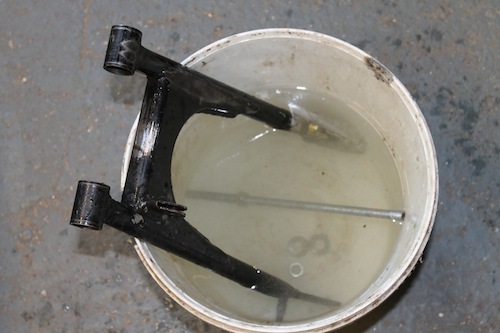 I wheeled out the Wilkinson "Abominator" jig. I made this in my kitchen a couple of years ago. 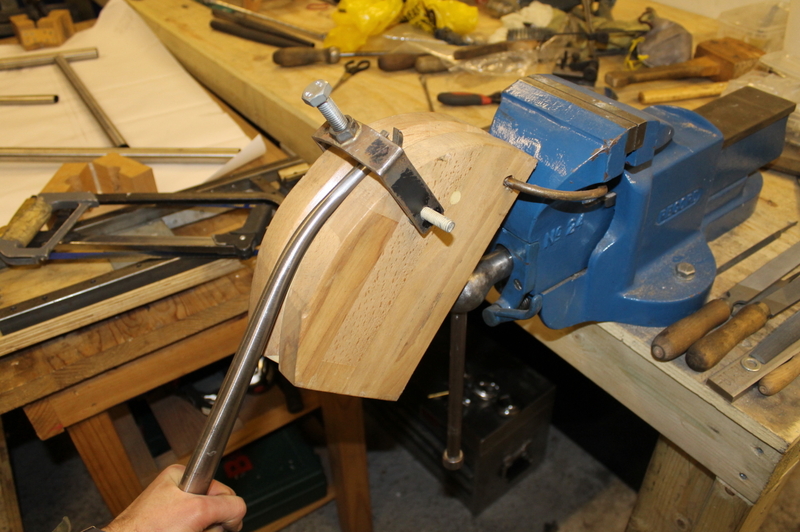 The swivel vice has a V-groove and I got it from Axminster. I must upgrade soon. Donations welcome. 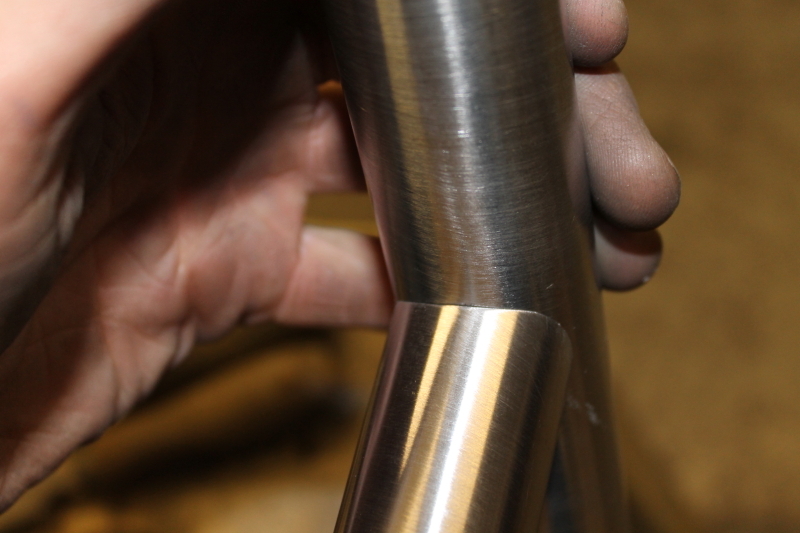 Silver brazed headtube/downtube. 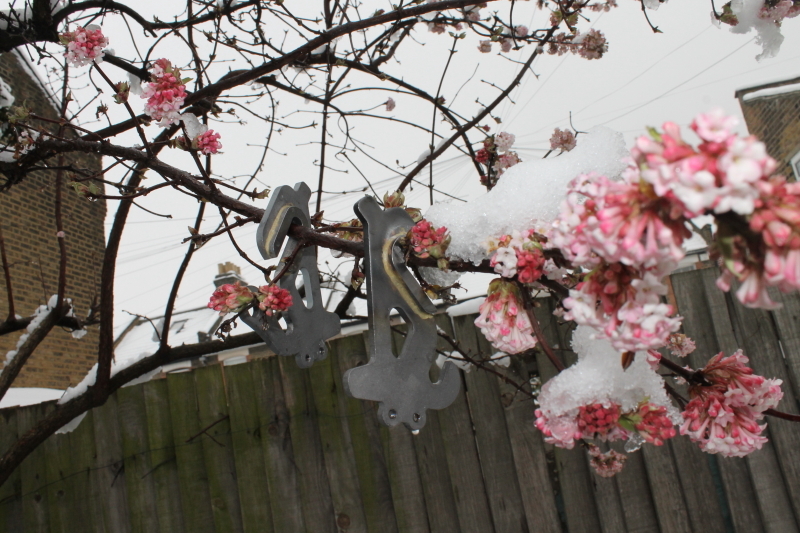 I used Cycle Design's "Stainless Light" flux. It comes off easily with water. 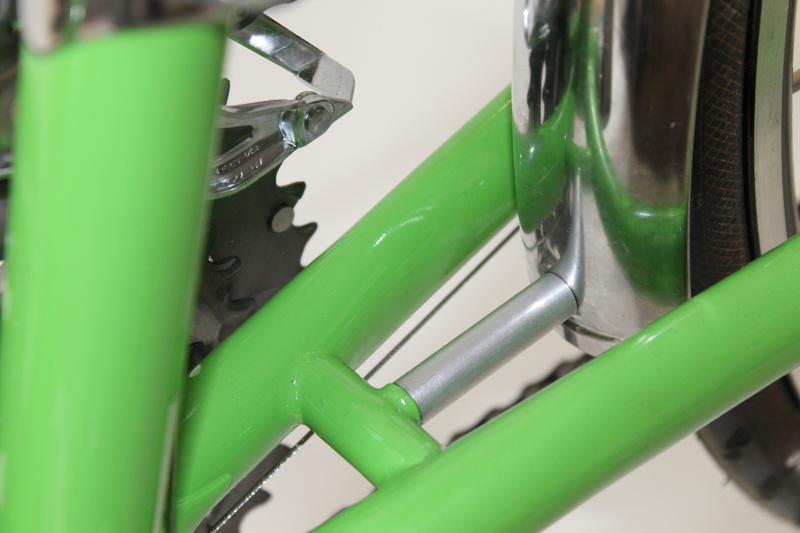 Internal cable routing. How hard can it be? 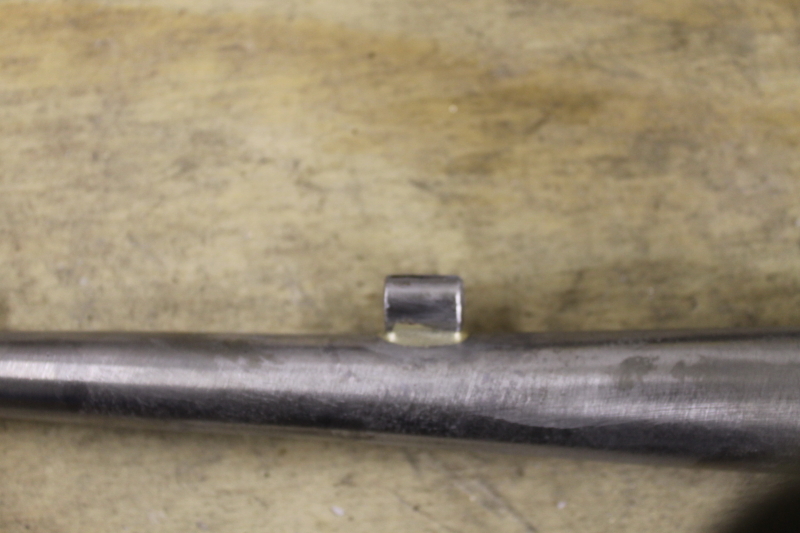 Some eight hours later, after making sure the internal brass guide didn't touch the tube wall, rattle or kink, I got it all brazed up. It was rewarding when I got it done. Lining up everything with the drawing. Ok, I own up. I made a mistake. 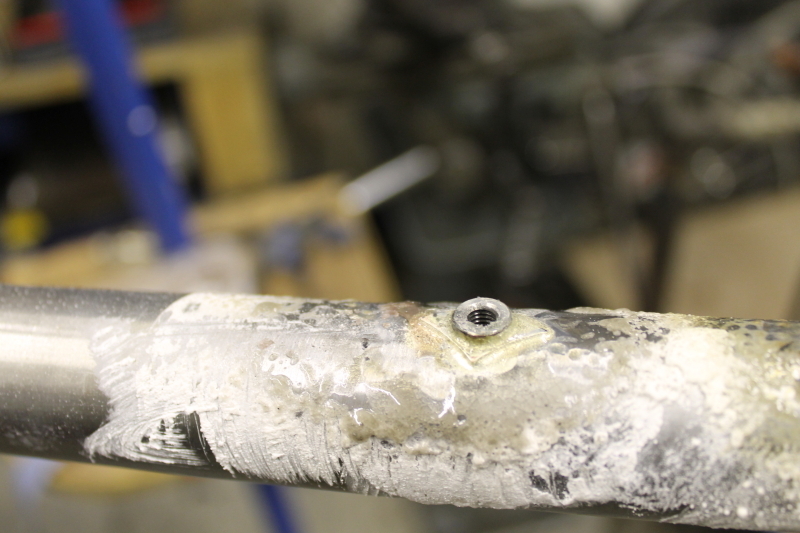 When I was planning the cable run I looked at an American bike in the workshop and a German road bike at my house. 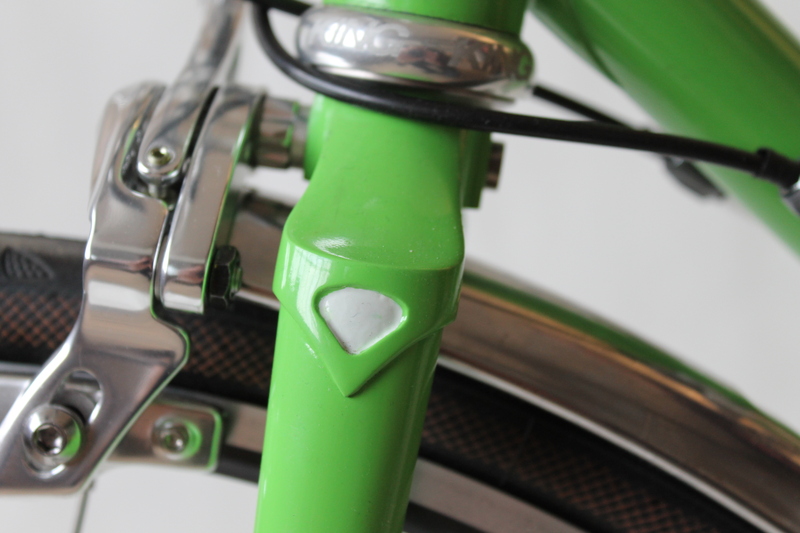 Brake levers on wrong side. Whoops. What a wally. 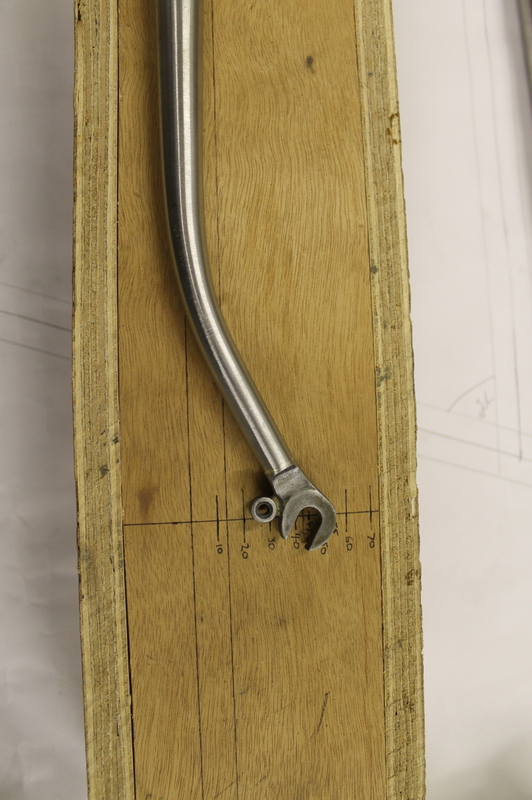 I had offset the internal cable entry and exit to suit a right hand rear brake lever. 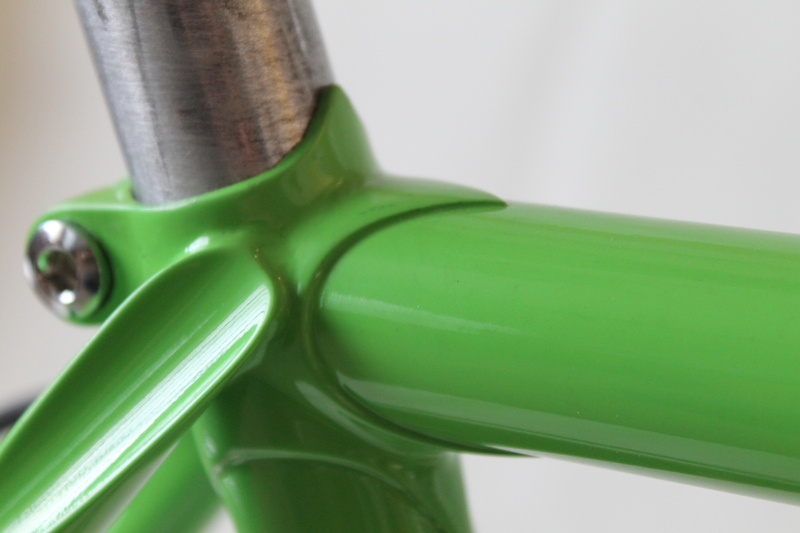 Remember that the cables should cross in front of the head tube to give a decent run. 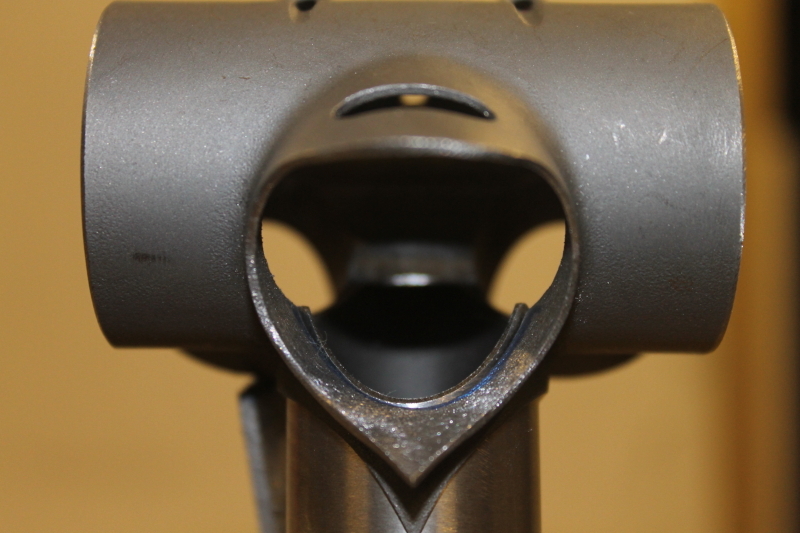 So… in keeping with the concept of this bike, and in order to partially conceal the cable entry point, I put it underneath the top tube at the front. 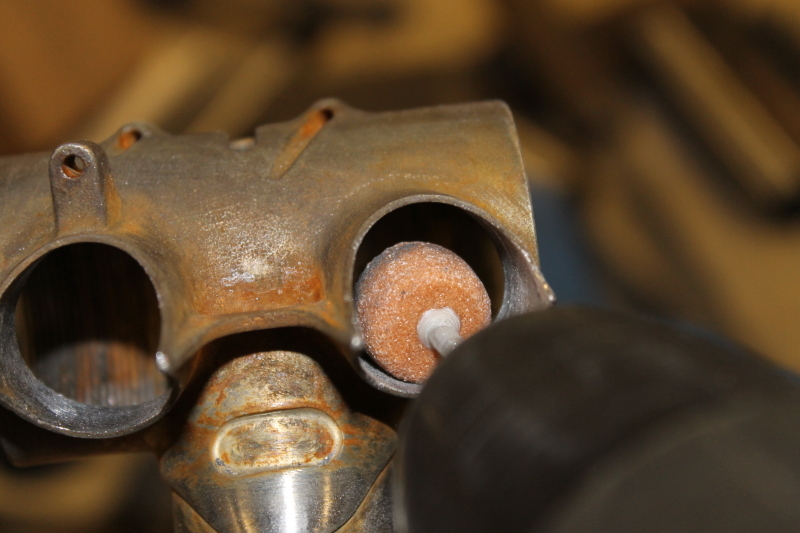 This gave me a better cable run and a side-exit to the rear caliper on the correct side. A serendipitous event, no less. Hoorah! 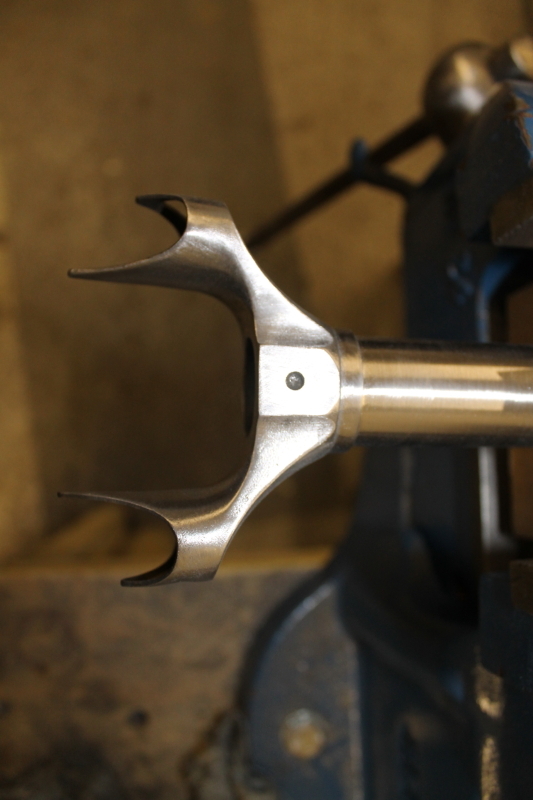 The top head lug needed to be blacksmithed to conform to the tube. 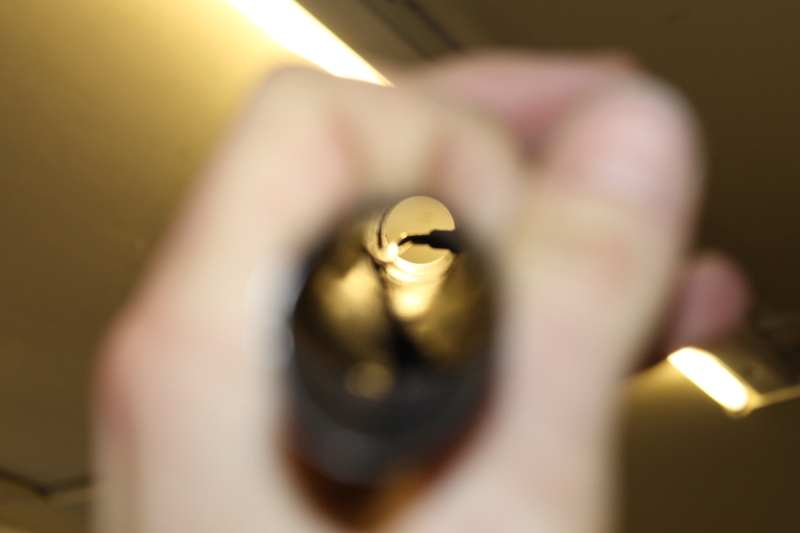 I tapped it with a small brass drift made from a bathroom door sliding bolt lock, after squeezing it in a tubing block. 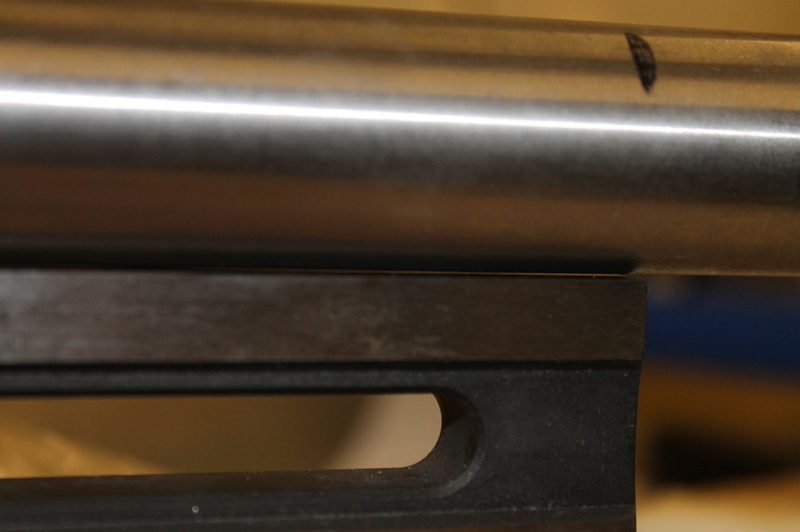 And I also had to file the point shorter on the lug, as it was overlapping the first lug's point. 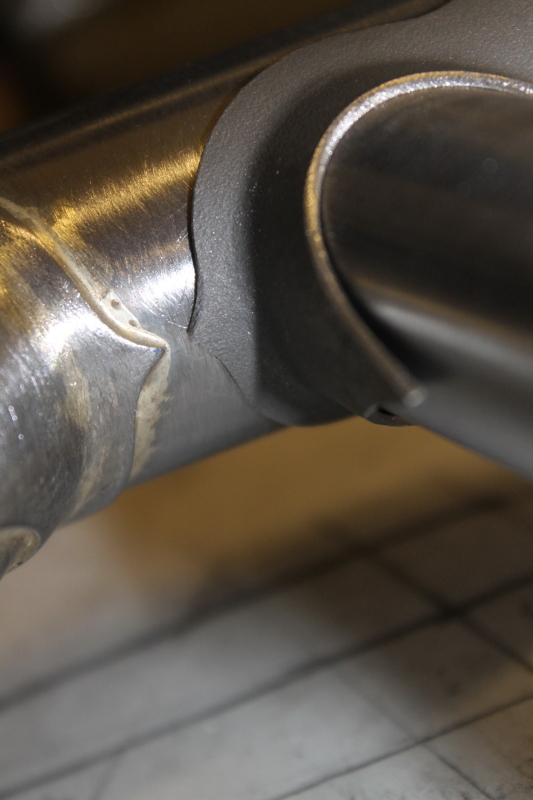 A peril of short head tubes. 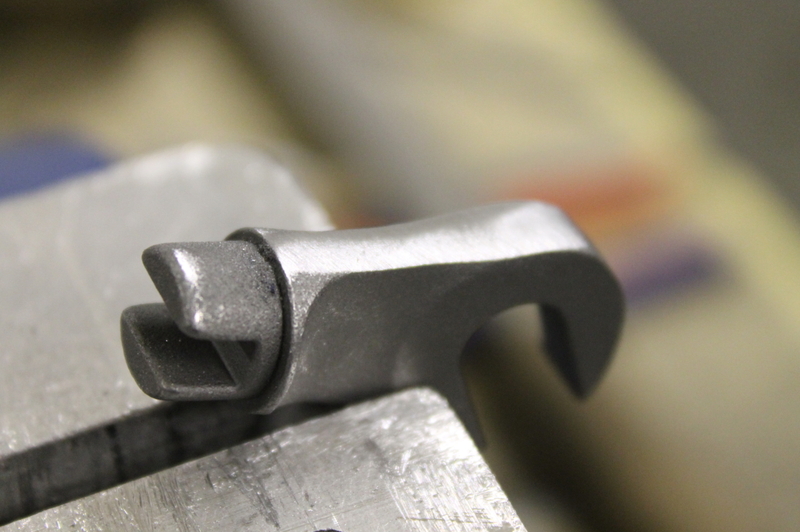 Checking the fit in the lug. Testing the fit on the tube. 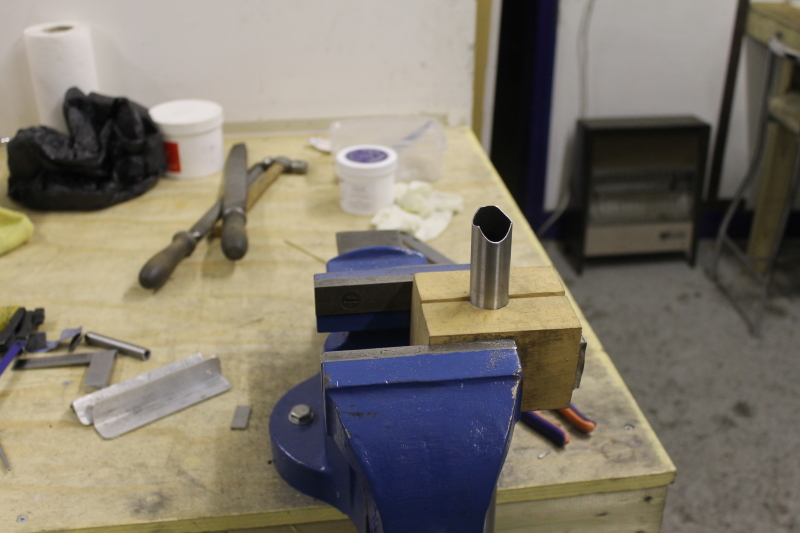 Grinding out the chainstay sockets in the BB shell. 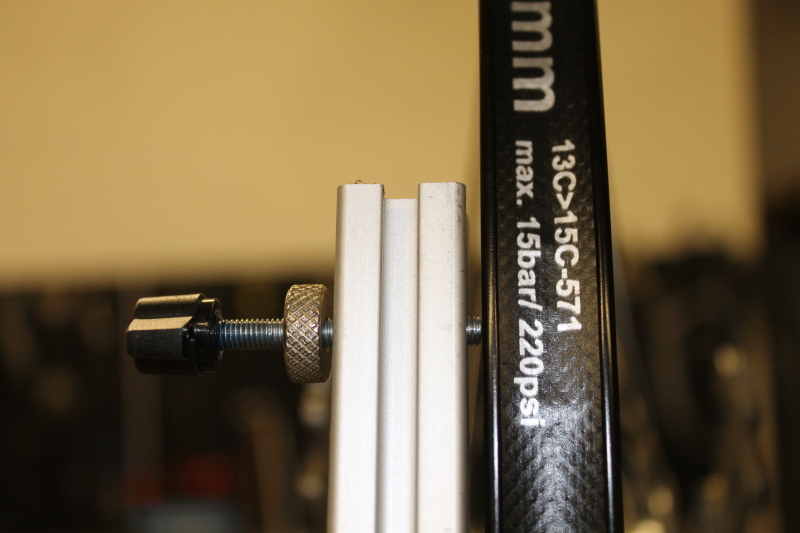 My belt and braces approach to dropout alignment. 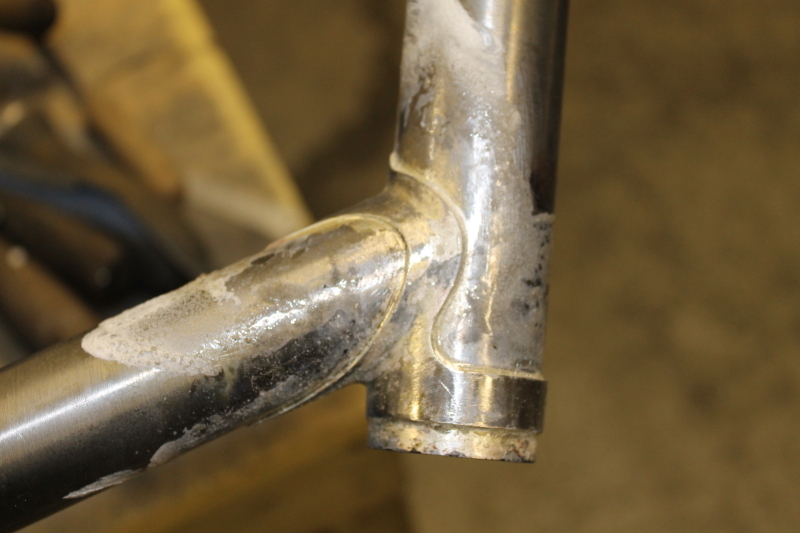 Cleaning out a chainstay so the brass will take to it. 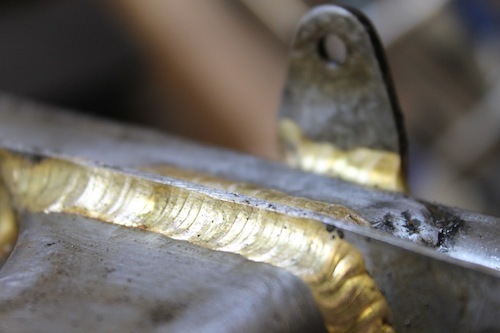 Fluxed and brazed with brass. Lots of cleaning up to do here. 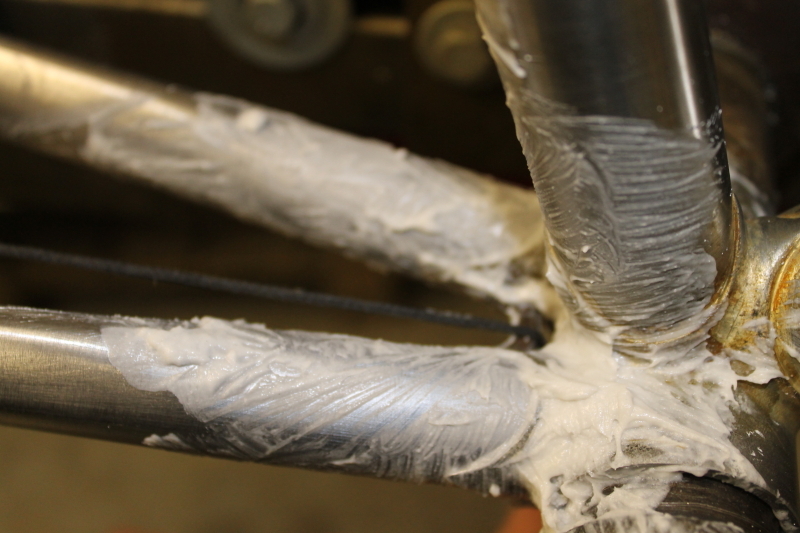 Time to silver braze a gear cable stop onto the chainstay too. After soaking the flux off under the tap. 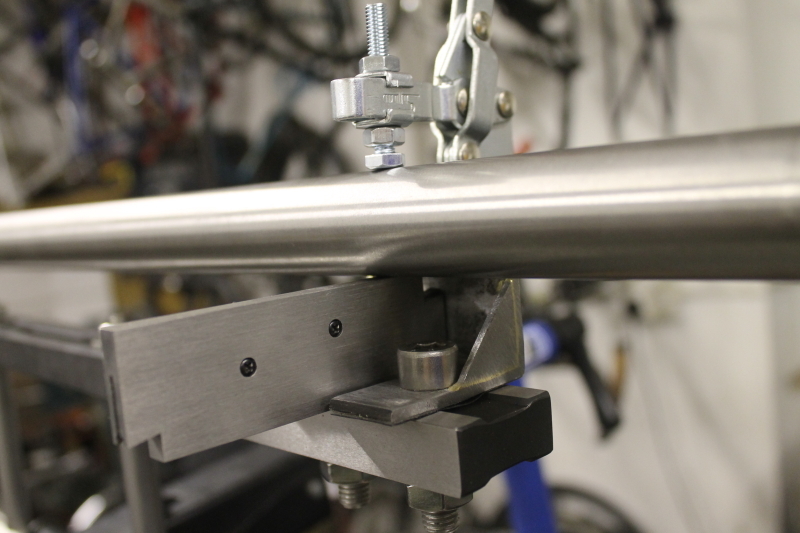 I decided to put the chainstays in on Ryan's frame jig. 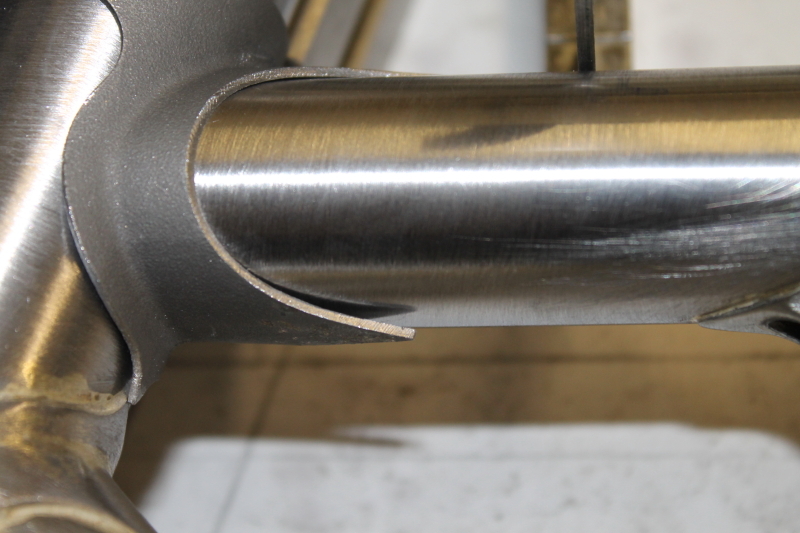 The stainless band on the seat tube will stay unpainted for a 31.8mm front band-on mech that won't leave damaged paint to be visible in fixed gear mode. 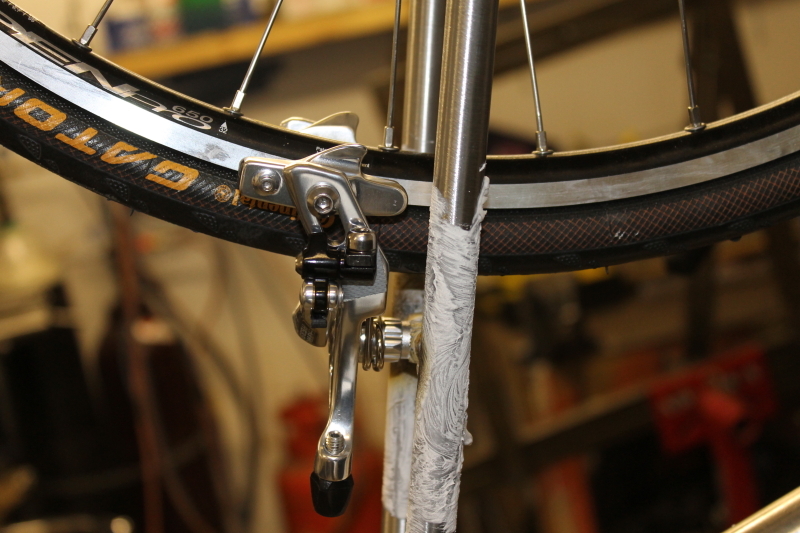 I ran a cord from the dummy axle to the BB to double-check the seat tube/chainstay angle with a protractor. 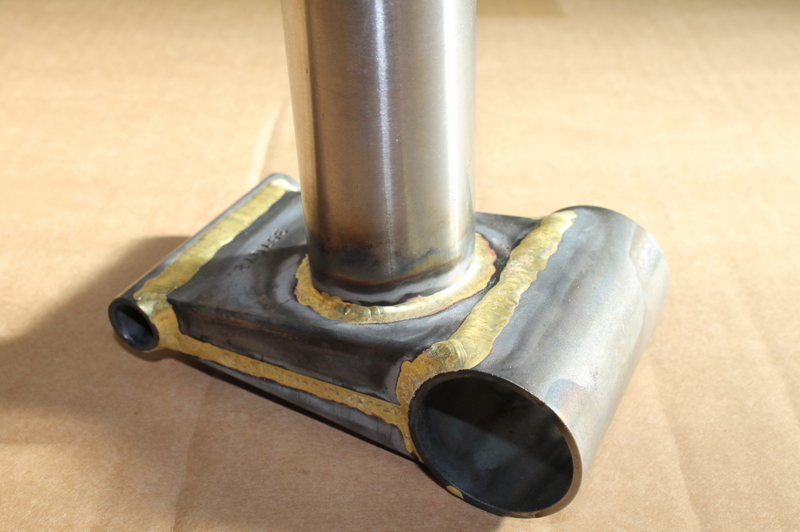 I brazed the tops in the jig, then finished in the Park stand. 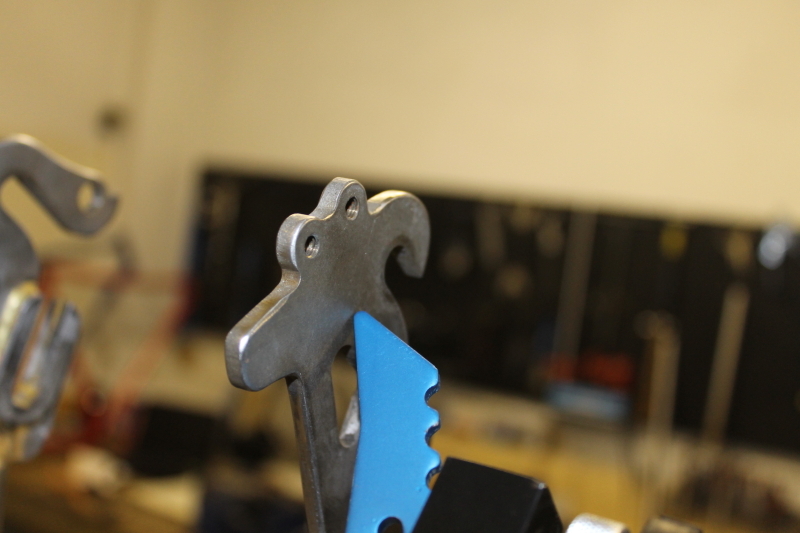 Next I drilled holes for the bottle bosses. 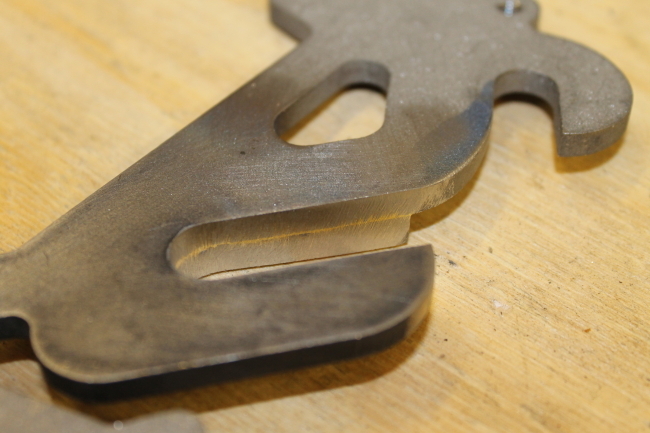 I had to enlarge them slightly with a round file. 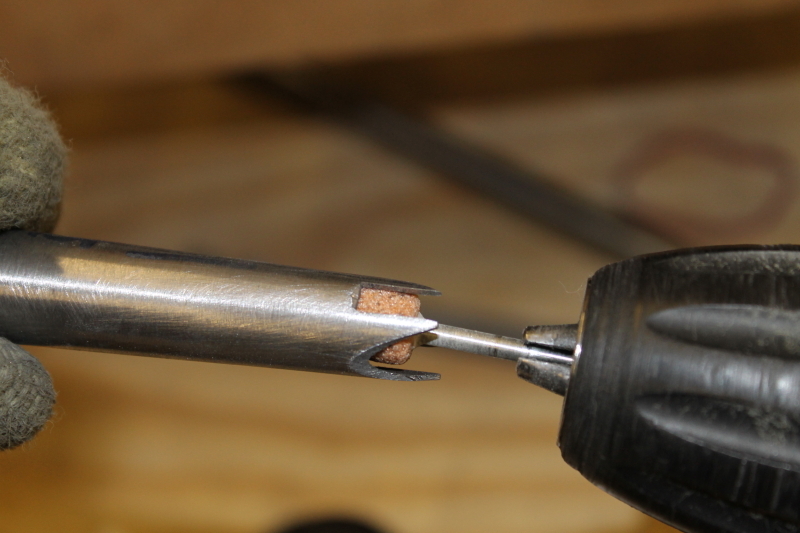 I had to improvise a way to hold the diamond reinforcement while I increased the hole diameter. I tried to resist the temptation to add that little bit more silver just to "make sure", but it gets me every time. 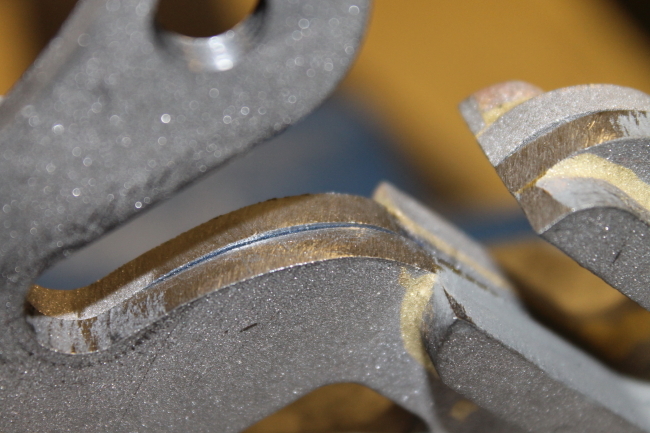 Let's check the rear spacing..
..Matches the right alignment according to the Park FAG-2 tool. 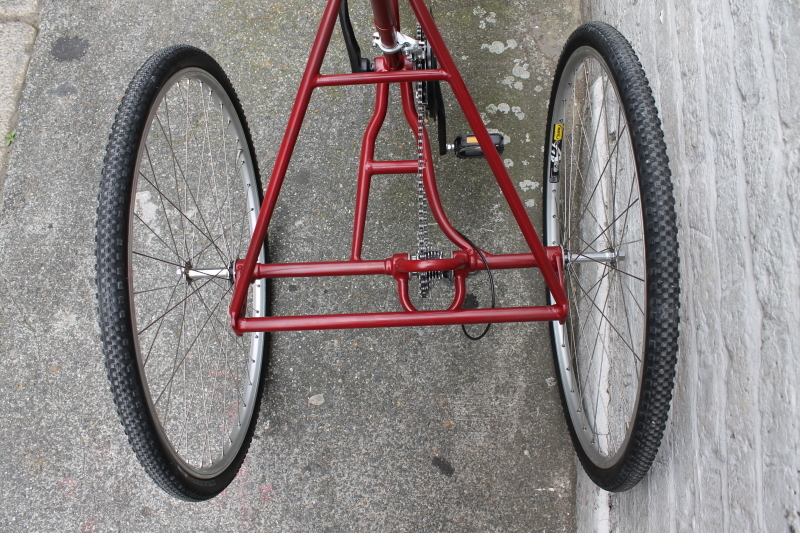 Rear wheel looks fairly centred. I built and dished the wheel myself so I know the rim is centred. 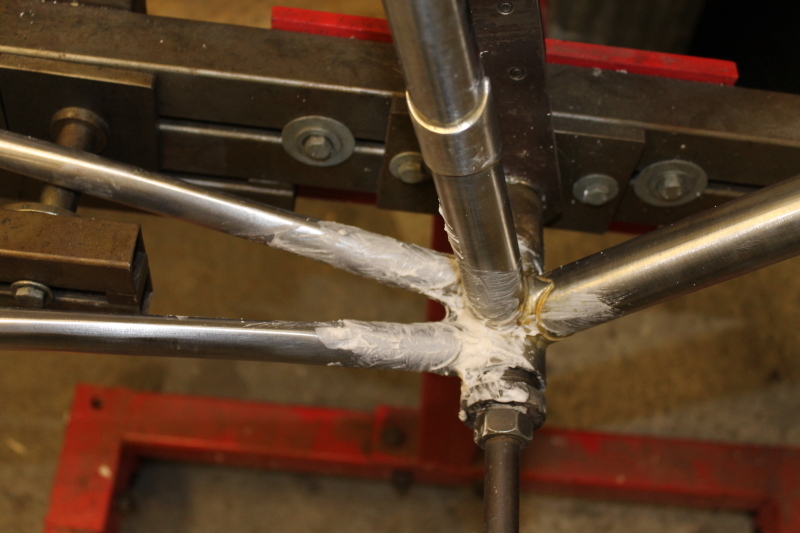 Same goes for the fixed rear wheel. 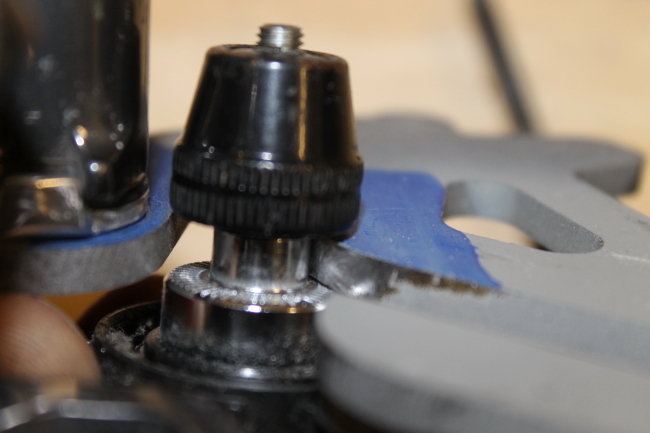 Time to use the piece of extruded aluminium I tapped and put an M5 threaded probe through. 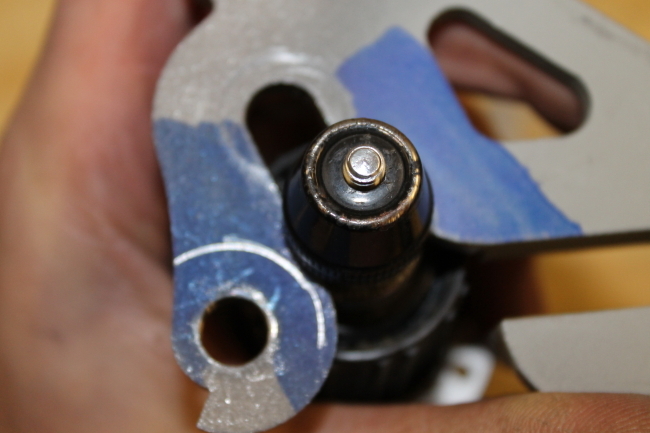 Use it like the FAG-2 tool but touch the 3rd contact on the wheel rim, not the dropout. This shows that the dropouts are level, and one is not higher than the other. 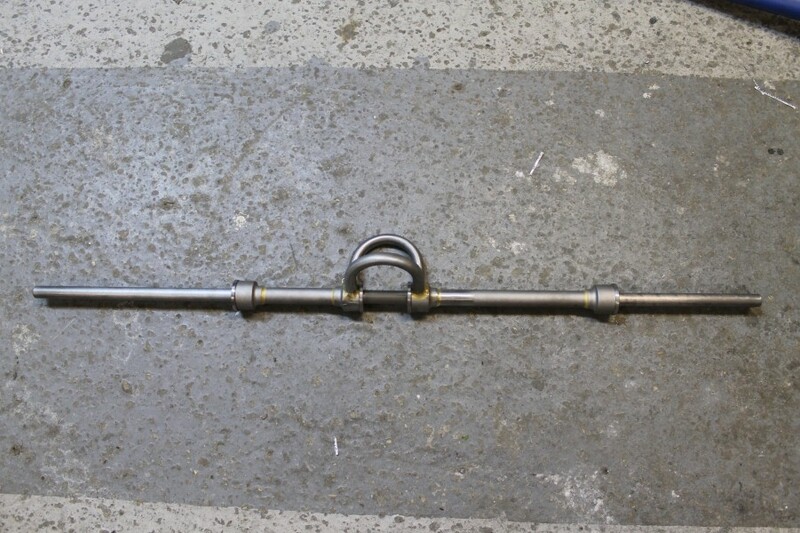 After pulling the stays around, the other side matches. A perfectly dished wheel is essential for this. 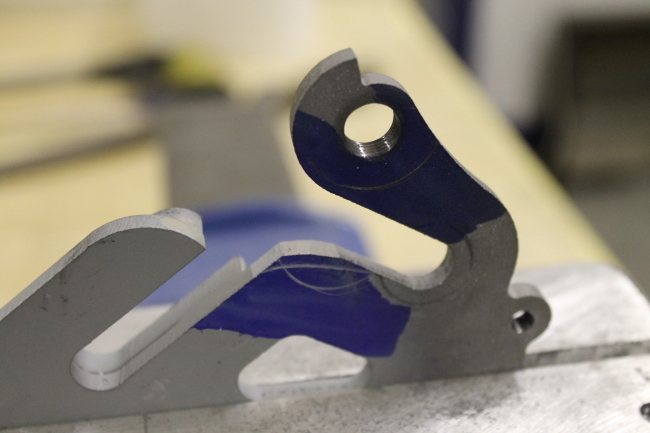 This is used before the seatstays are attached. 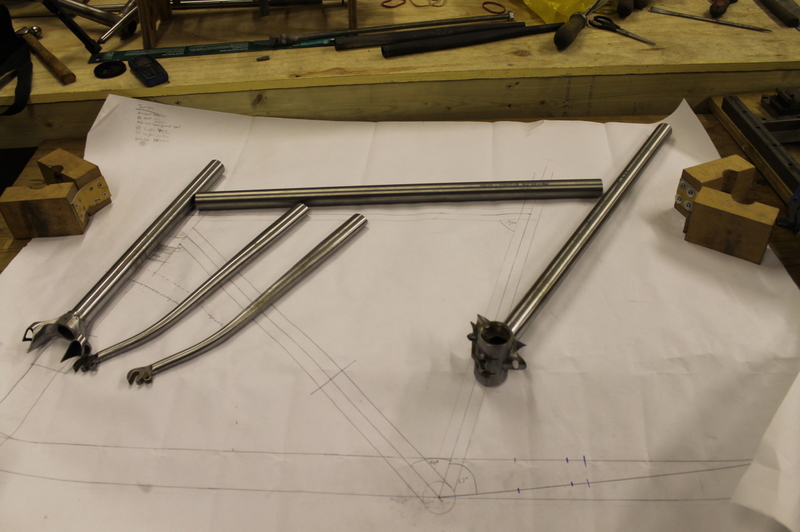 I checked the resulting angle of the chainstays against my drawing to make sure my geometry would stay as expected. 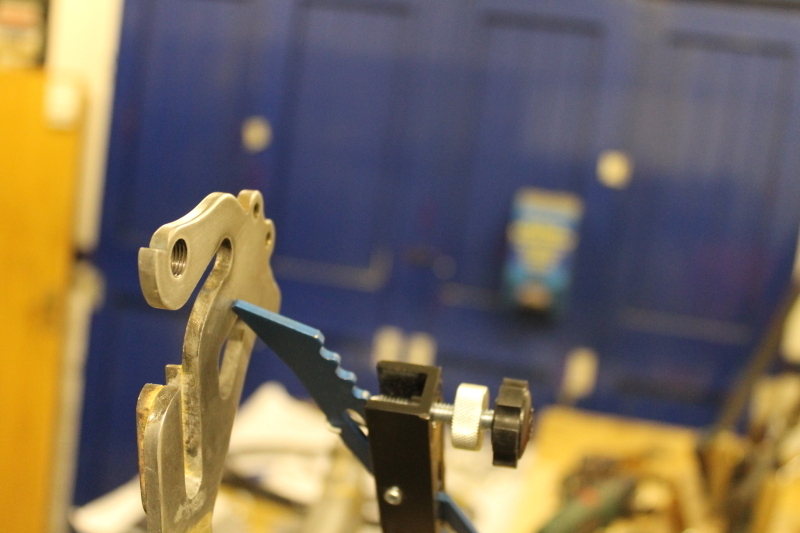 Getting the brake bridge right. A mudguard has to fit in there too. I have only tacked it in here. I got it in the perfect position eventually, and almost straight. 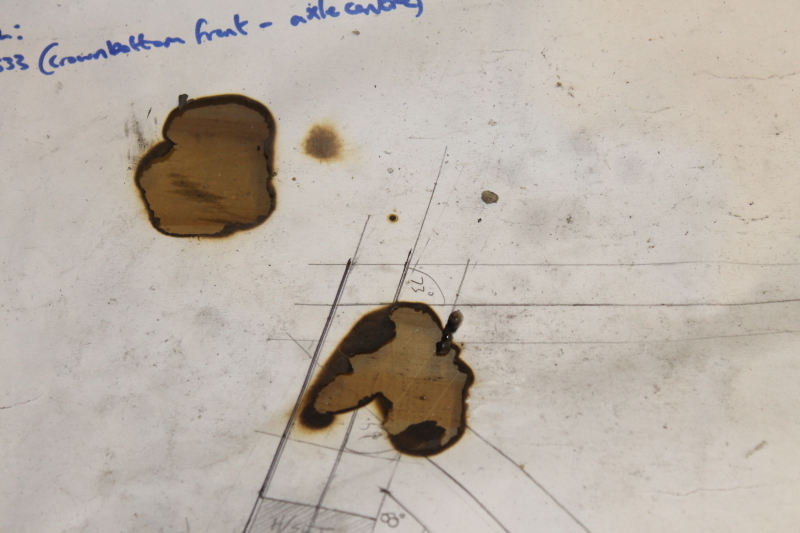 Note to self: procure something more fireproof to shield the drawing whilst tacking. 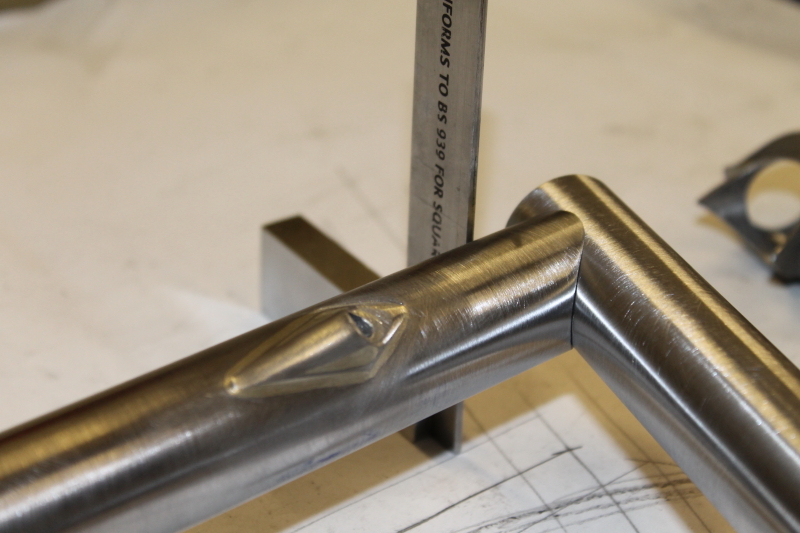 Although we have a cast iron surface plate in the workshop, I tacked the frame tubes on shimmed V-blocks on top of my drawing, which was on top of a sheet of 12mm toughened glass. 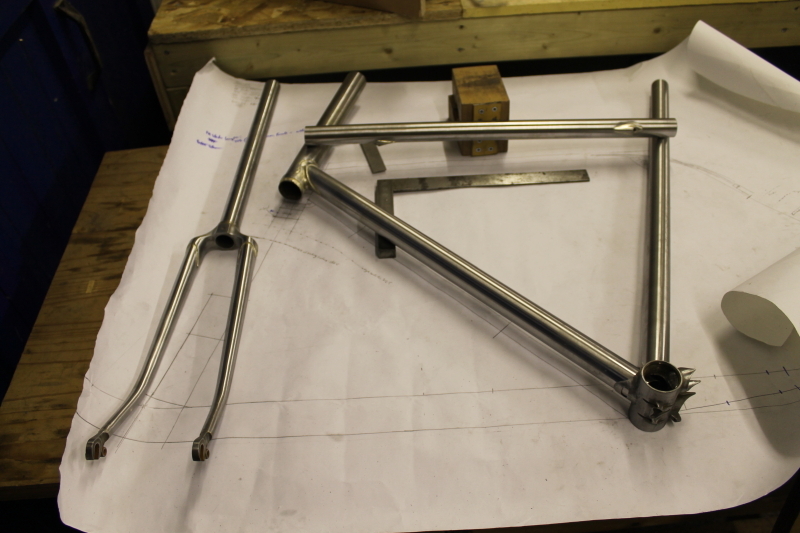 I’ve now taken the frame and fork to the painter. 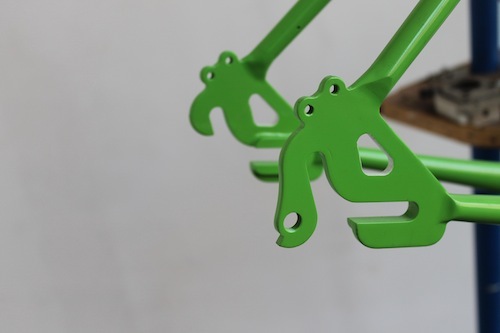 Tamsin my customer has chosen a very vibrant green. You have been warned.. 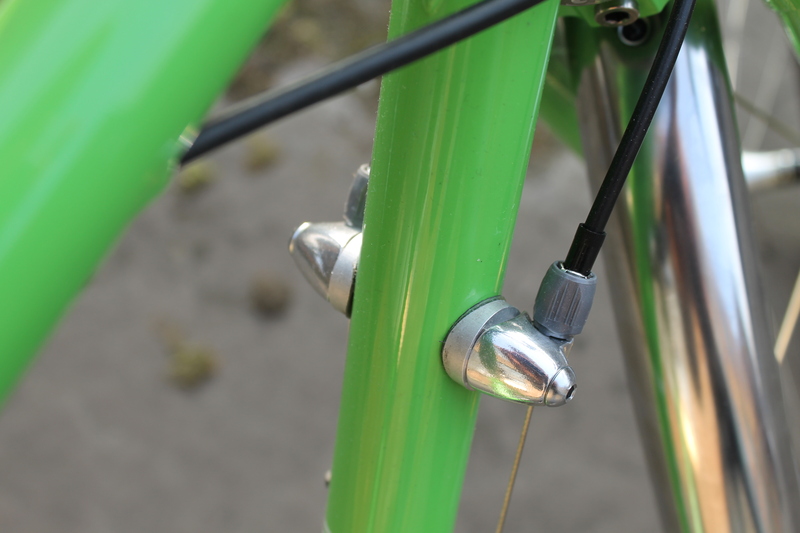 These are my fork ends. 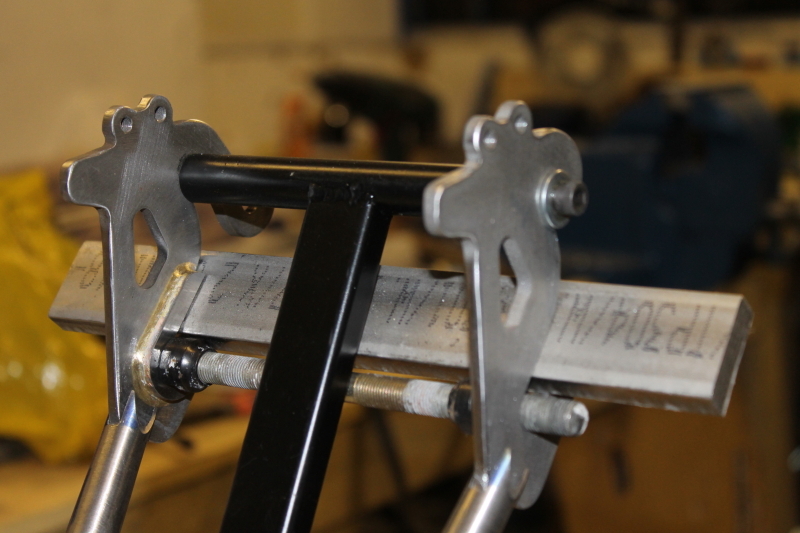 I'm going to cut the rack mounts off them but keep the mudguard mounts. One is done already in this picture. 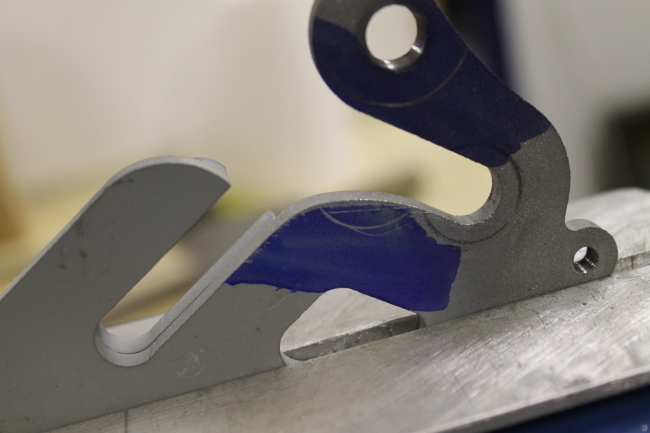 Filing them smooth after cutting. 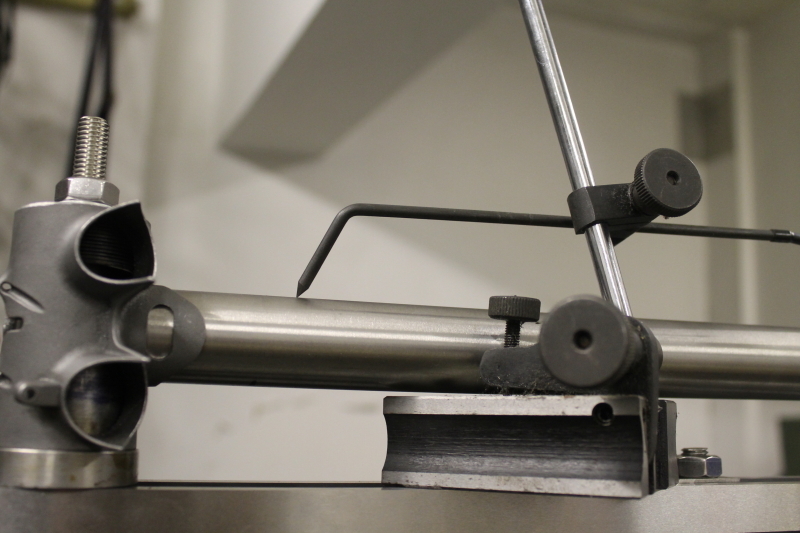 Bending my fork blades in the bender I made. 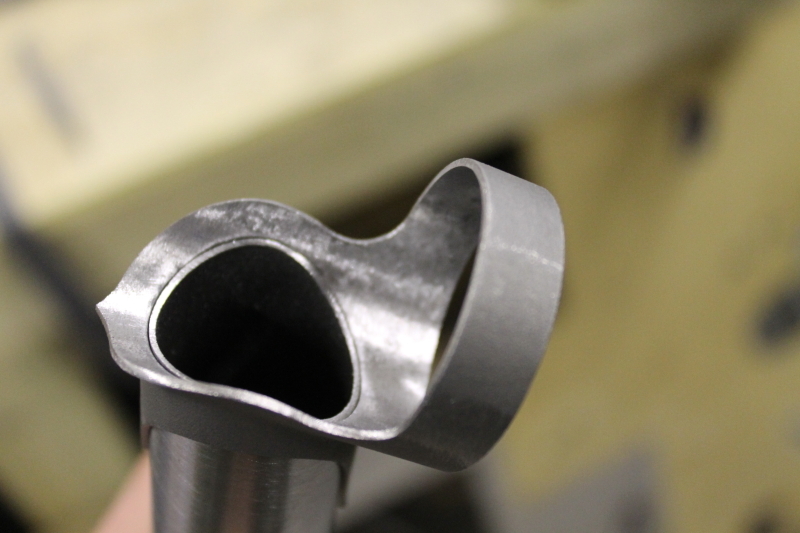 Not 100% happy with the curve I get, but it's not too bad. 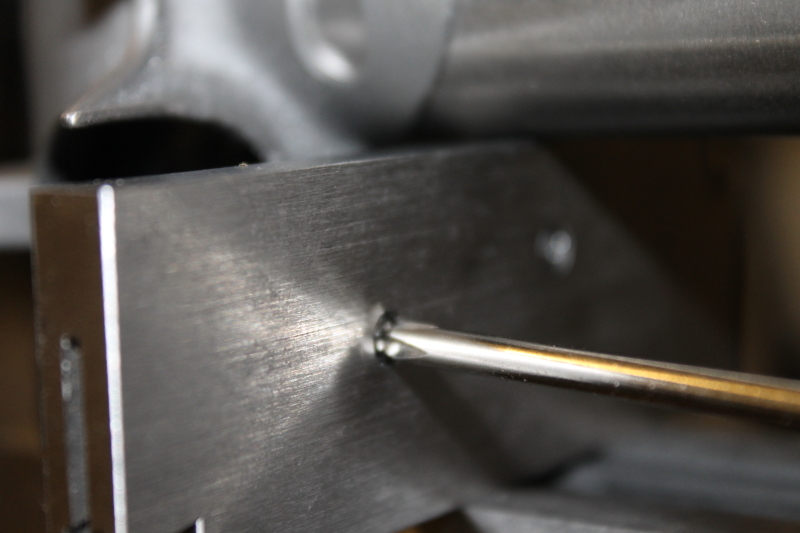 Checking the fork rake against my home-made gauge. I want 43mm of rake. 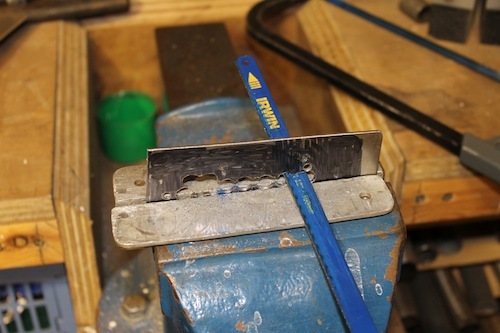 There are lines to centre the blade so it's straight. 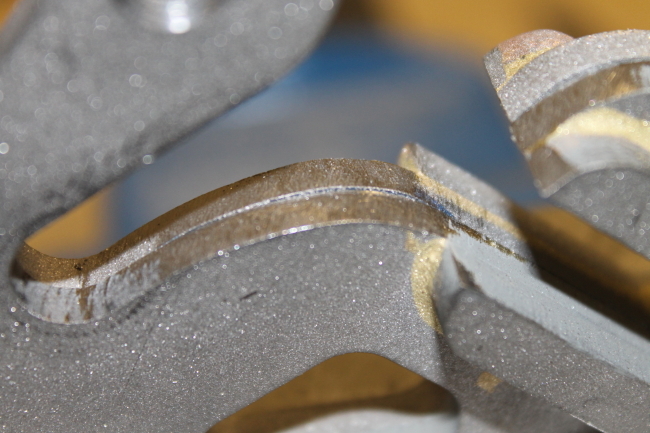 Cutting the blades to length. 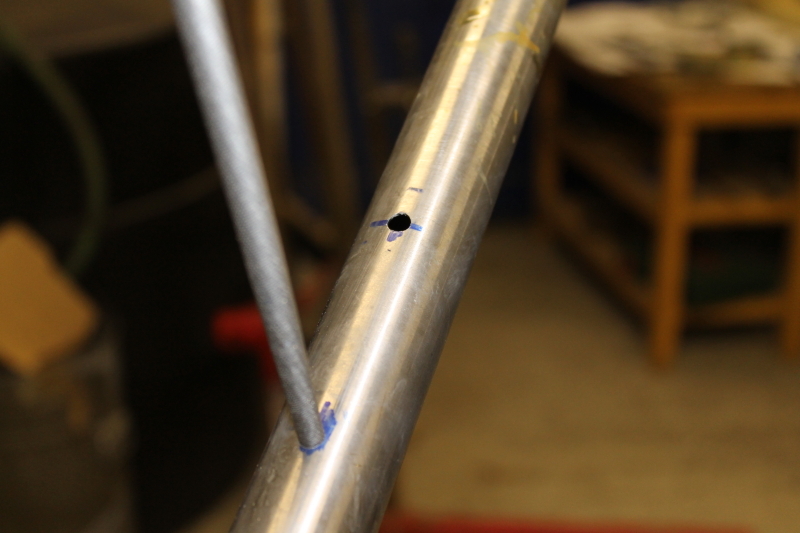 Finding the straightest side of the seat tube. 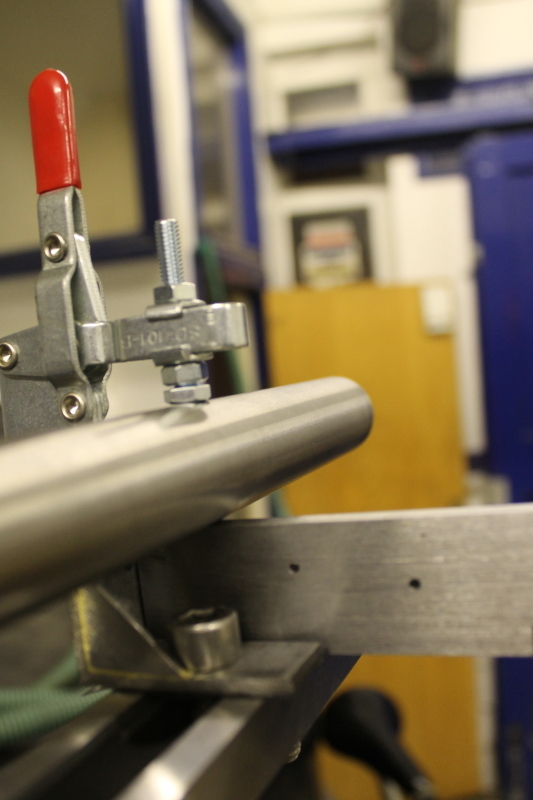 The worst side will be used in the fore and aft plane of the frame to minimise lateral misalignment. 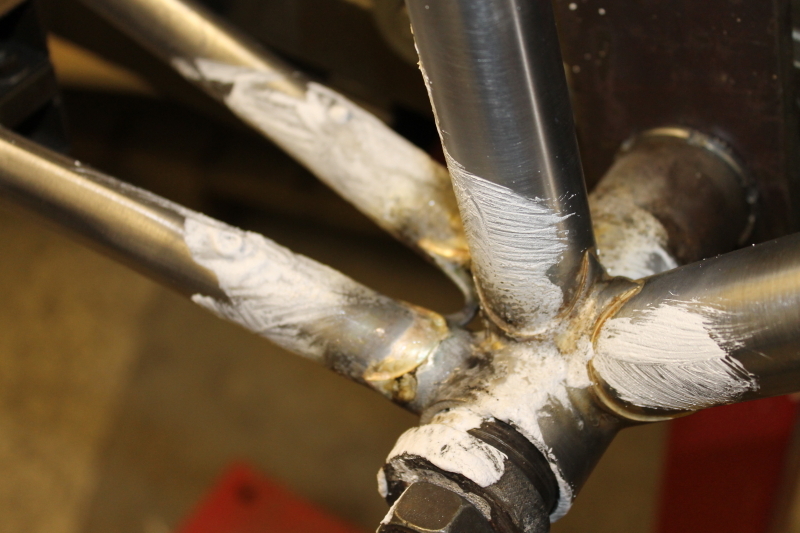 My seat tube is brazed into the bottom bracket shell after tacking and checking alignment. 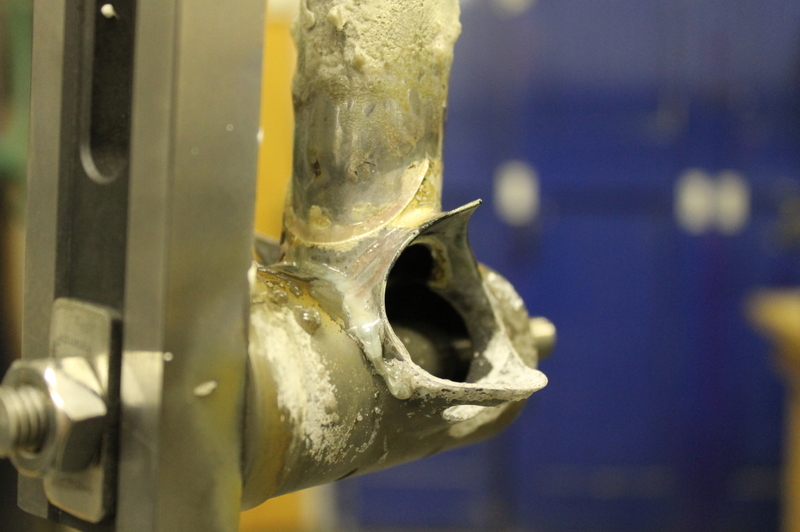 Oh yeah, and they let me try out brazing a bottom bracket assembly at work a few weeks back - here it is (it was rejected)... Come off it, it was my first one! 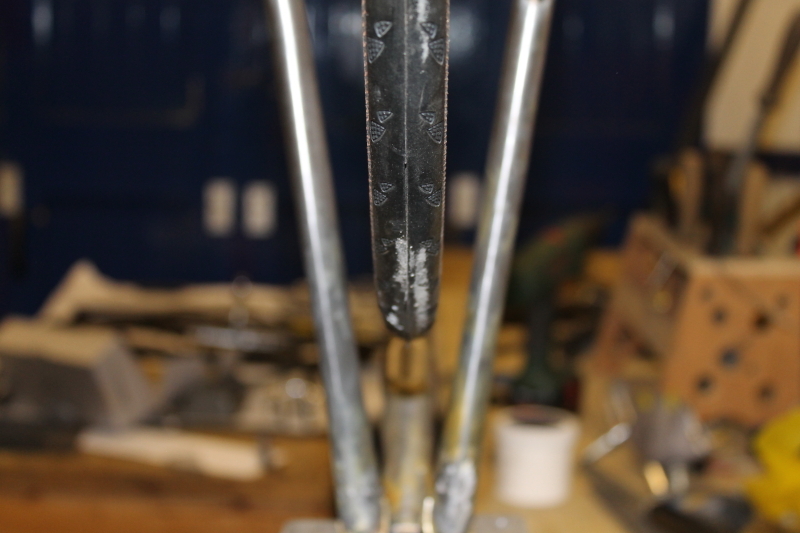 Here's my fork held in the Wilk-O-Matic SPX-3000 De-luxe laminate construction steel-reinforced fork jig that I made in my kitchen 3 years ago. 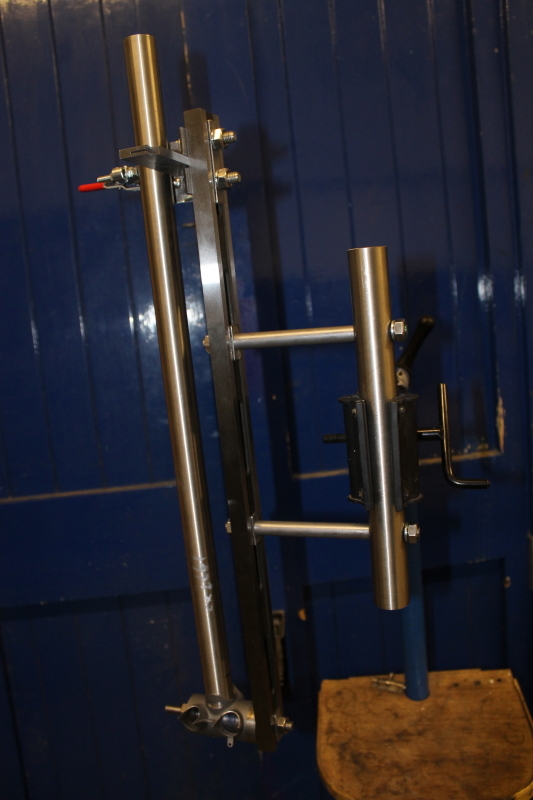 My workshop mate Ryan's just bought a proper fork jig so perhaps if I ask nicely next time I can use that.. The bits 'n' bobs so far.. 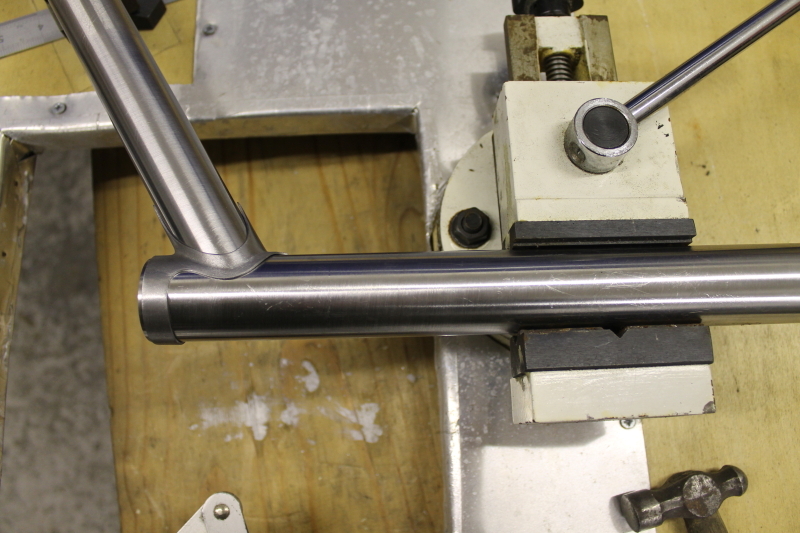 The top tube will have internal cable routing. 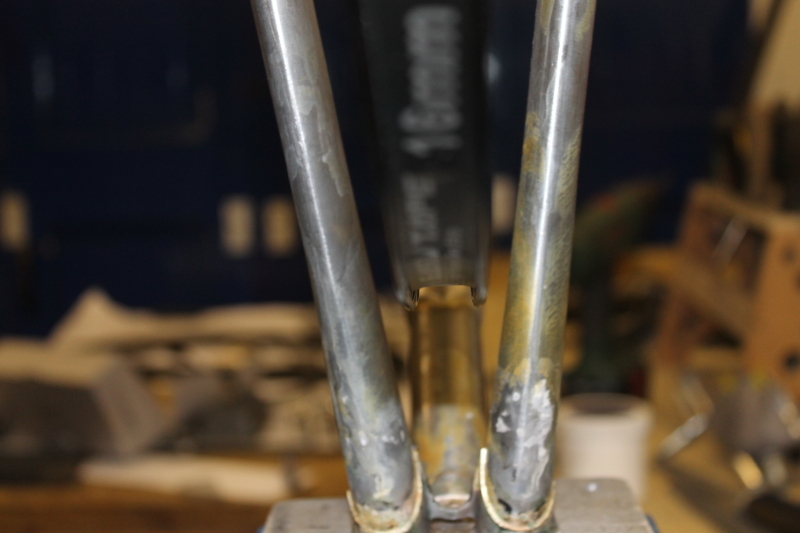 After brazing in the fork legs. The flux got a little tired and began to darken after I chased around the shorlelines with the flame, but I'm confident that I didn't overheat the joints as the steel didn't go red. It cleaned up nicely. 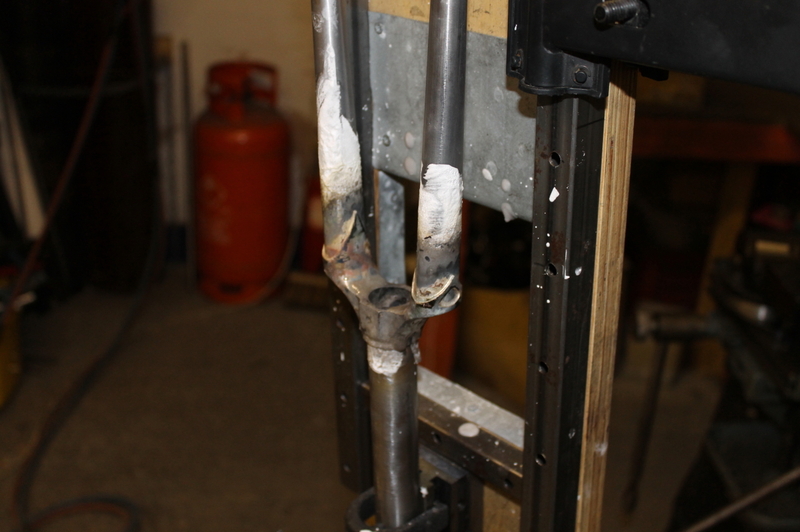 I’ve done quite a bit more on the frame at the time I upload this, so there are more pictures to come when I take my camera to the workshop. 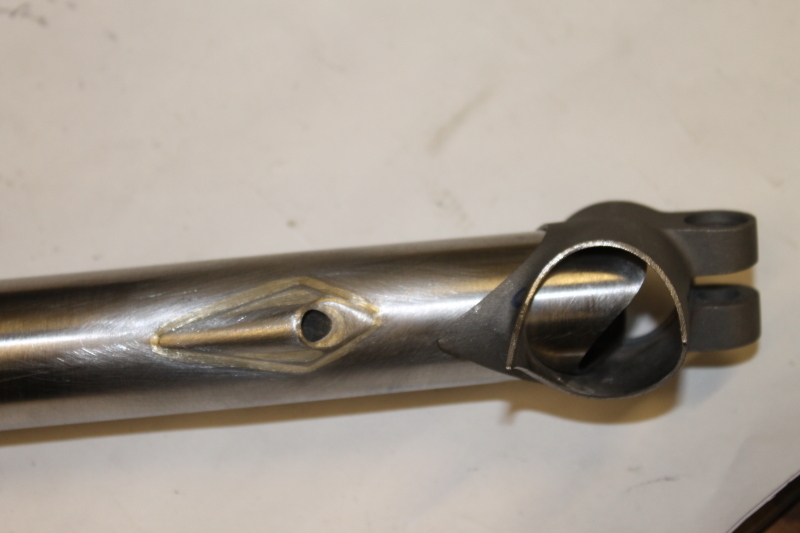 My tubeset has arrived from Reynolds and I’m ready to draw the frame design. 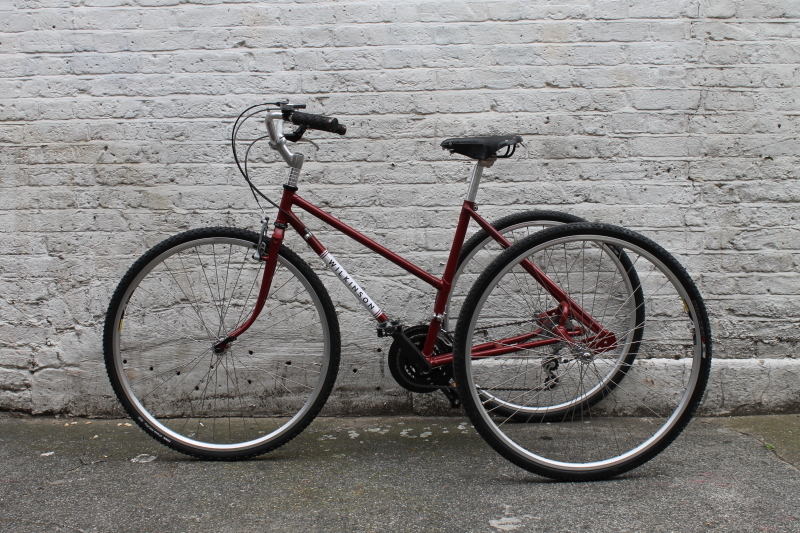 I plan to use 650c wheels as they will allow a little more room for mudguards on this smaller frame size, whilst still being able to take fast 23mm tyres for zipping around town as a fixed wheel bike. 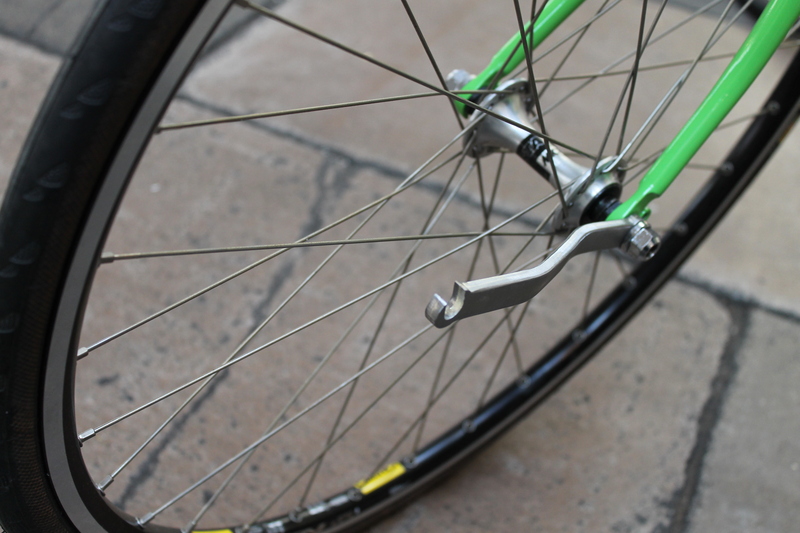 The rims can take up to 28mm wide tyres if so desired in “tour mode”. 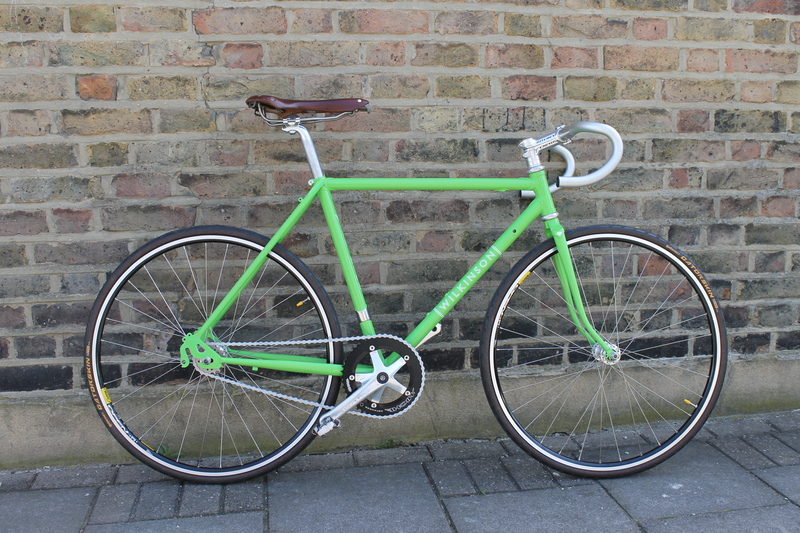 This bike is for my friend Tamsin, and I hope to show it off in the new builders’ room at Bespoked, the UK hand built bicycle show in March. 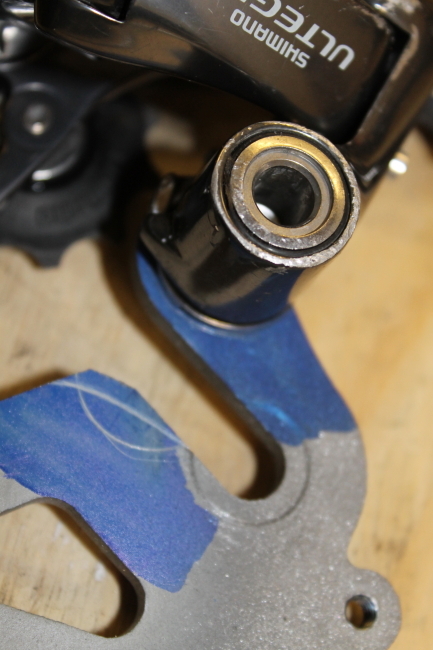 Following on from my last post I have to allow some more clearance for the rear quick release nut to pass the derailleur pivot so that the rear wheel could drop out cleanly. 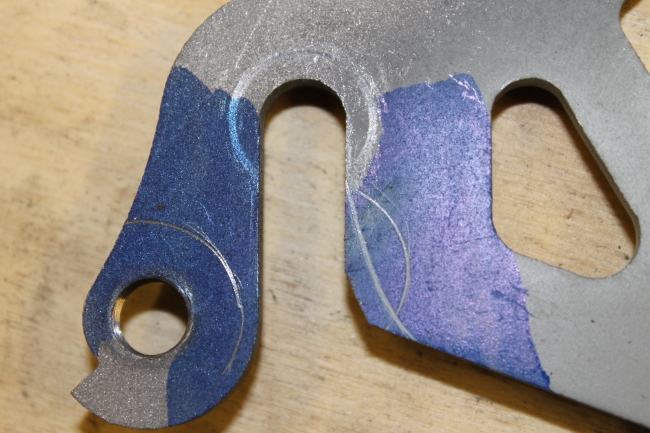 I marked the dropout with a marker pen so that when I marked the required clearance around the nut and derailleur, my scribed lines would be easier to see. I then scribed a line to round off the inside corner. 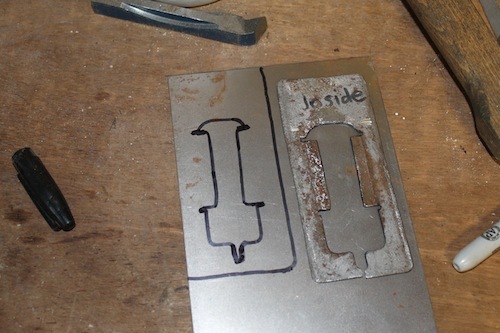 I had to file carefully in the vice to avoid nicking the other surfaces. I tried to get a smooth curve. 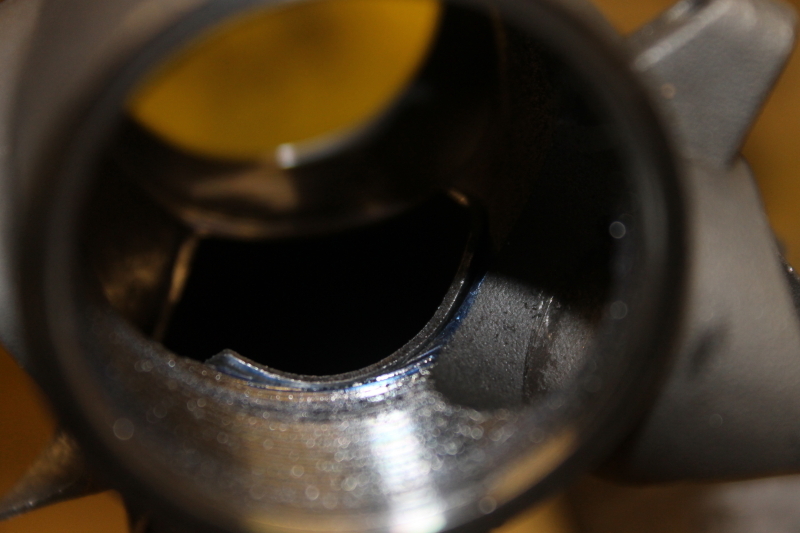 Checking to see if it will pass - the nut I used here is quite large, over 19mm. I thought it would be best to check the fit with the "worst case scenario" size. 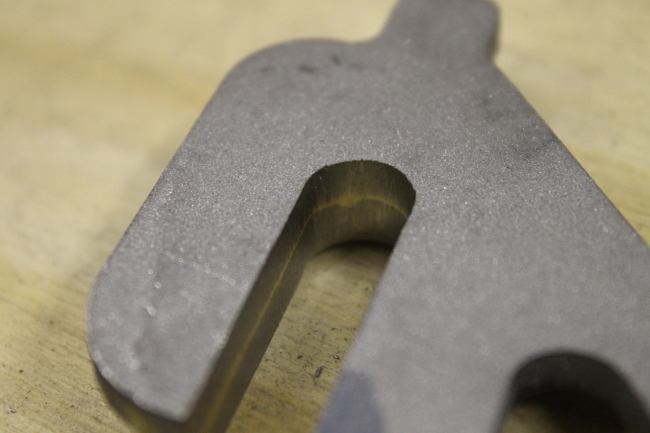 The 1st drive side dropout became a template for the non-driveside dropouts, and vice-versa, with flat plate against flat plate. I scribed a line tracing the corner. 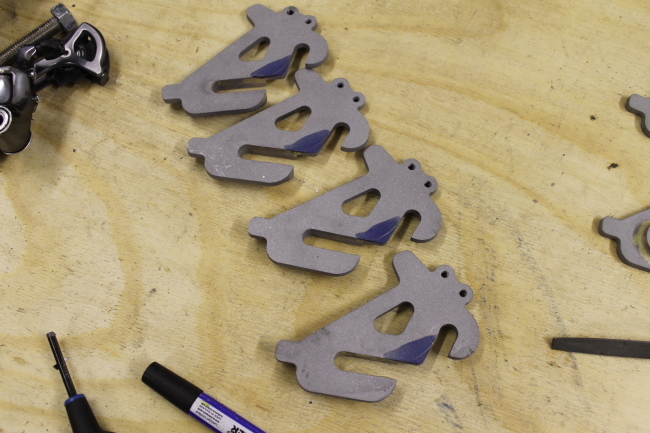 Marking up a batch to be filed. Before (top) and after (bottom). 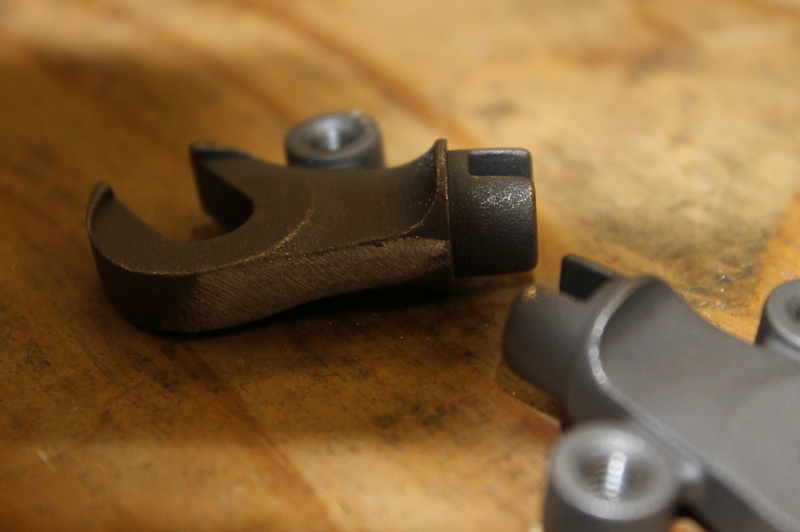 I'll clean up the stray brass a little and try and remove that broken bolt in the rack mount. Never use a blunt tap.. 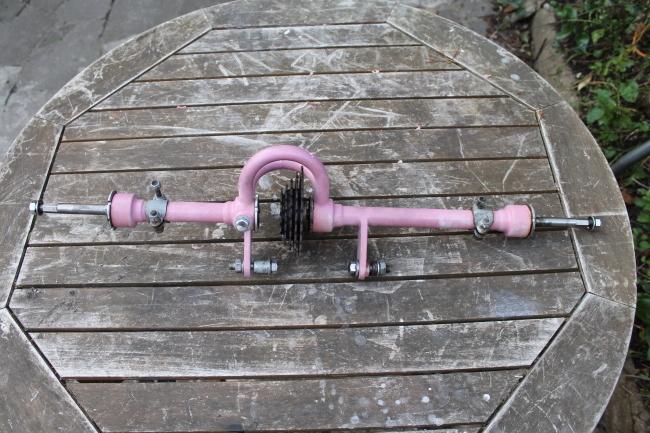 I bought a much higher quality tap to finish all the other threads properly. 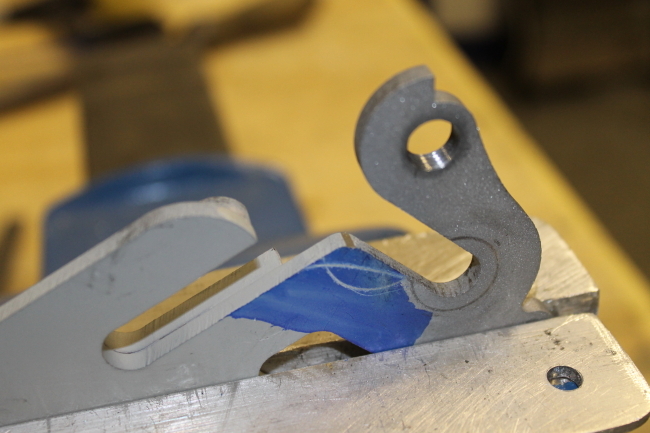 Filing in the vice to the template dropout. 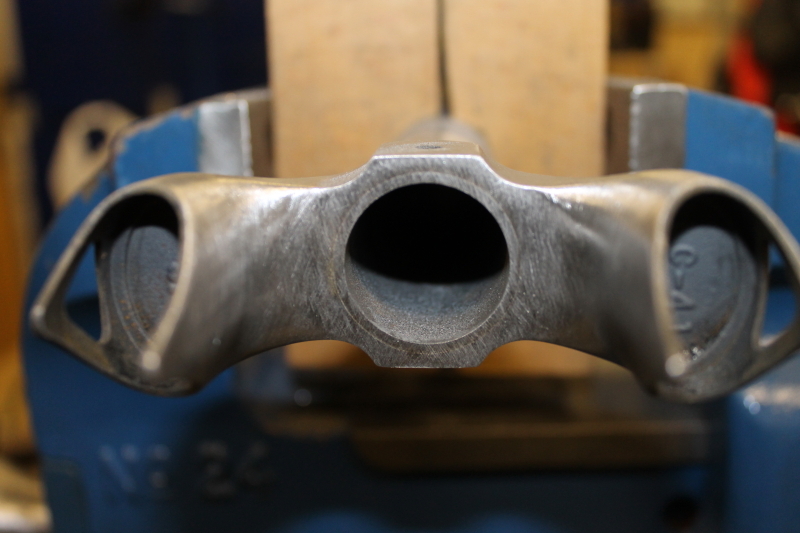 I filed the inside of the track ends flat and parallel, smoothing out any lumpy brass. 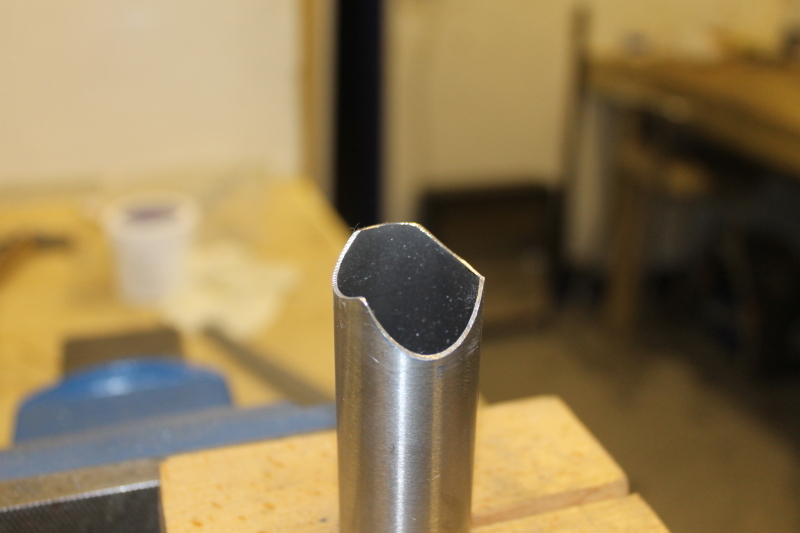 I used a round file in the curve. 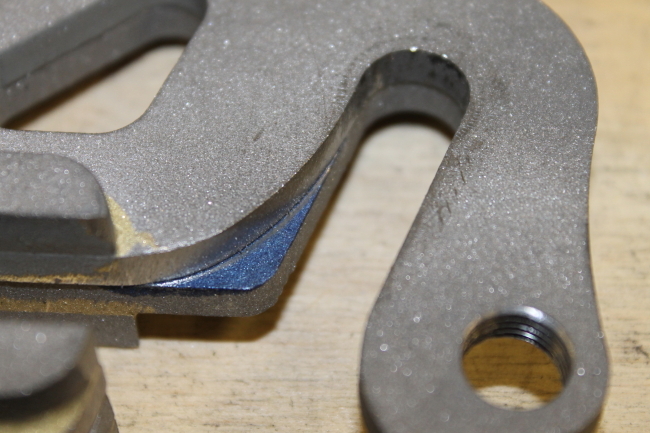 On a few of the dropouts I cheated and touched in a little brass from inside if there were any small gaps (come on, I am a newbie). This obviously had to be cleaned up with files too. 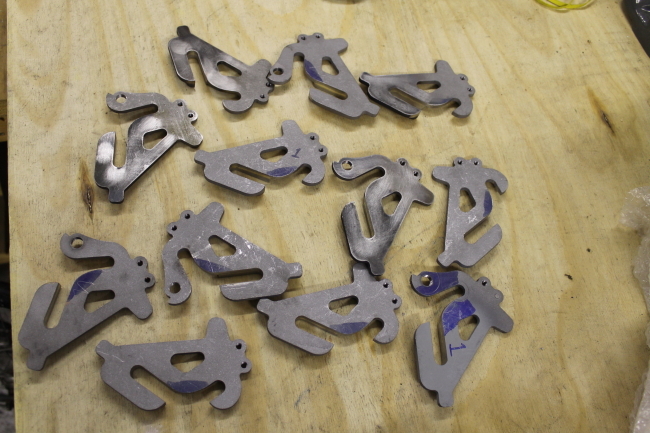 A flock of filed dropouts.